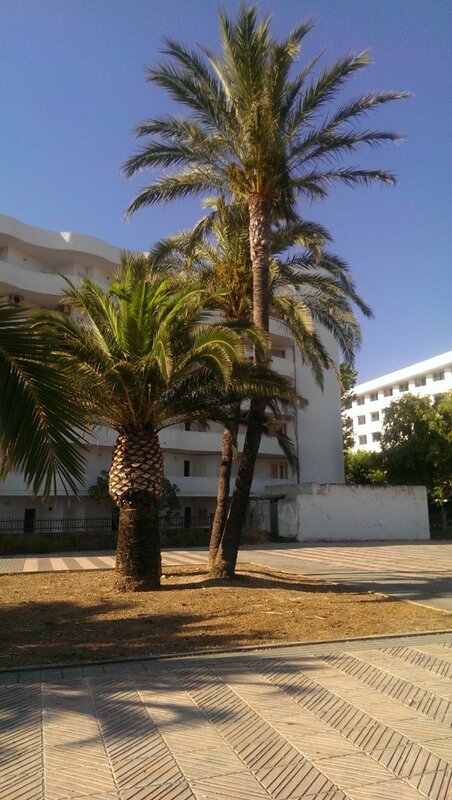 Becci's holiday to the Spanish island in the Mediterranean. 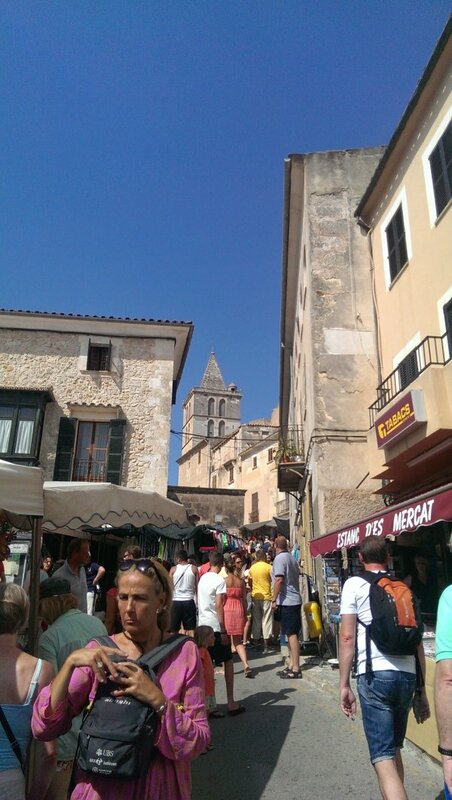 Mistakenly called Majorca by the tourist trade of last century, the name is correctly spelled Mallorca, and pronounced mah-YOR-cah, with a gentle "R" at the tip of your tongue. And the water tastes great. Crossing the eastern Pyrenees, looking west over the Ariège valley. 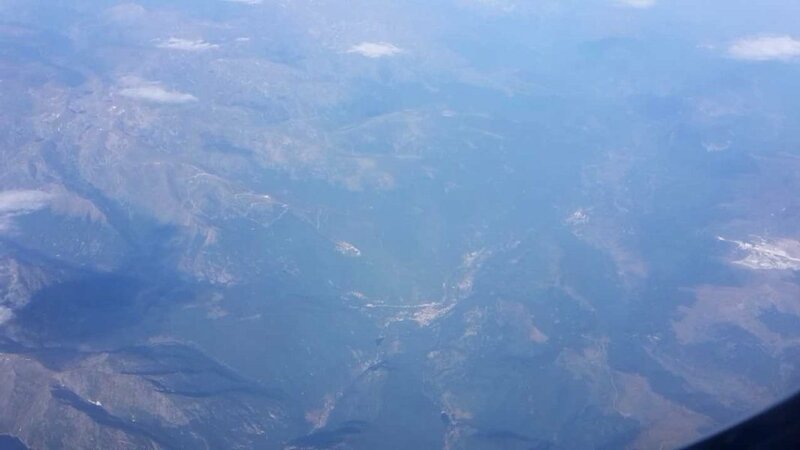 The mountain ridge on the left, which is the border between France (right) and Andorra (left), starts at around 2700 metres tall, extending to Pic de la Sierra (2912 metres) in the distance. Port de Pollença. 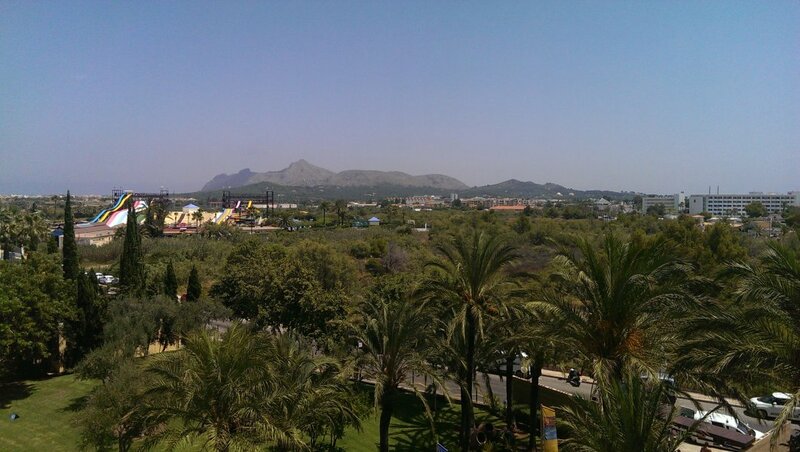 The mountain in the distance is Puig Tomir. 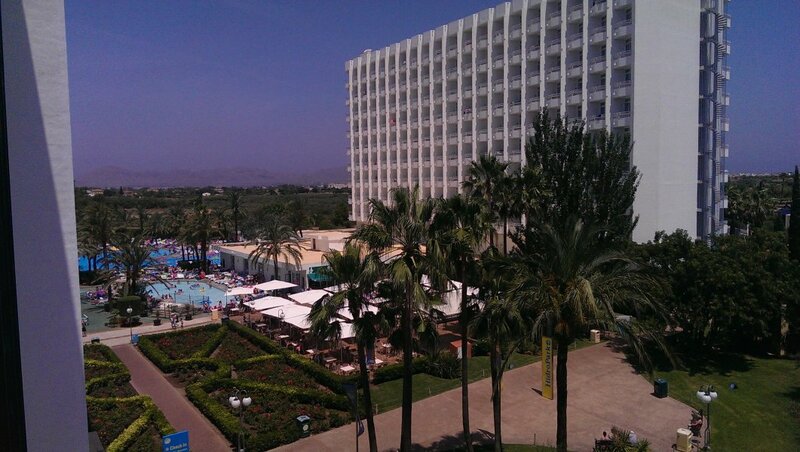 Club Mac hotel at Port d'Alcúdia, a complex of 3 hotels, teeming with holiday makers, mostly Brits. This is not the place for a quiet vacation. 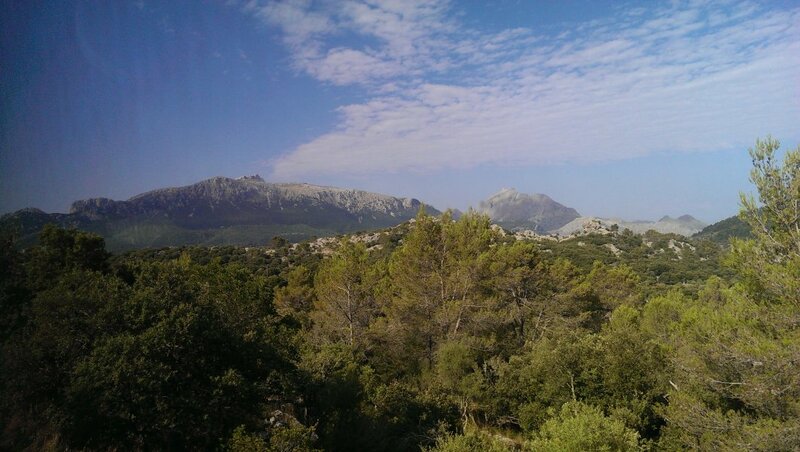 The ridge in the background is the northern Badia de Pollença peninsula, with El Morral (353 metres) in the middle. 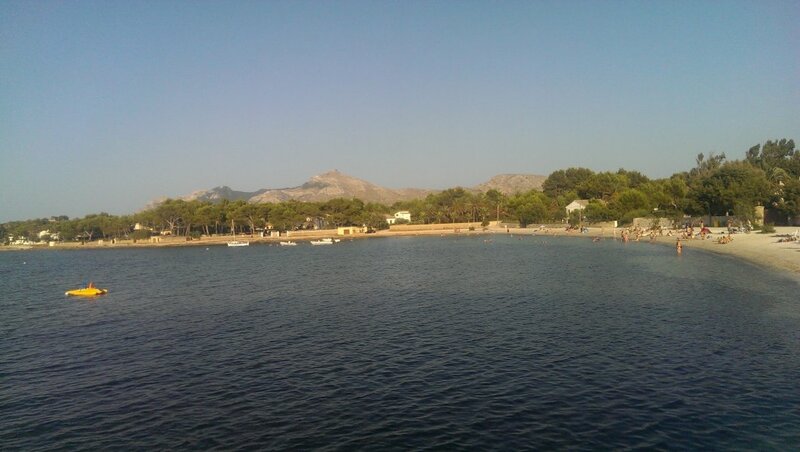 Southern Badia de Pollença peninsula, which begins at Alcúdia, with the highest peak being Talaia d'Alcúdia (496 metres), behind the large hydropark. Little and Large, at the start of our bus tour of Alcúdia; Avinguda del Tucà. 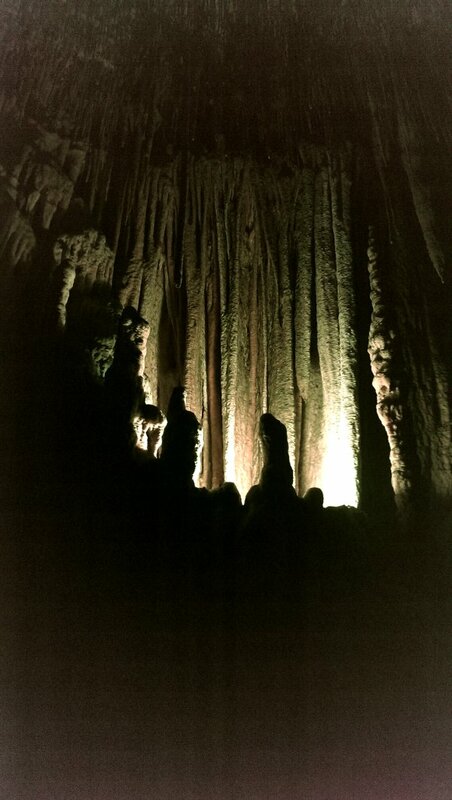 This is a package holiday with a selection of excursions like this. 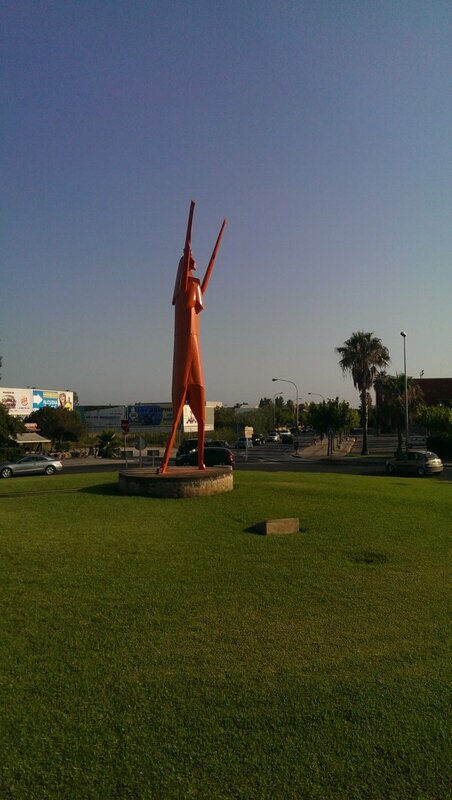 Statue on a roundabout on the way to the old town. Is it a horse? Is it a human? No, it's Superman. 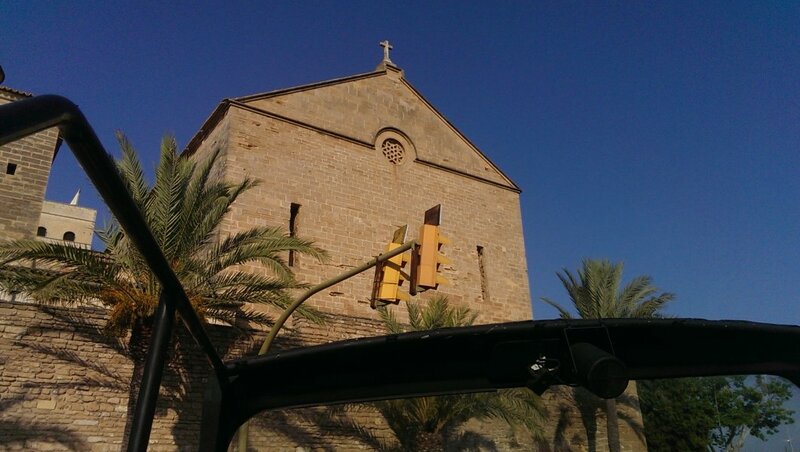 Església i Museu de Sant Jaume, on our way into the old town of Alcúdia. Barbican gateway into the old town. Bullring. Bull fighting is considered cruel and is therefore banned under animal cruelty laws in most European countries. However, it is legal in most of Spain, and may be practiced here. Morer Vermell beach on the southern edge of Badia de Pollença, looking towards the Alcúdia peninsula. 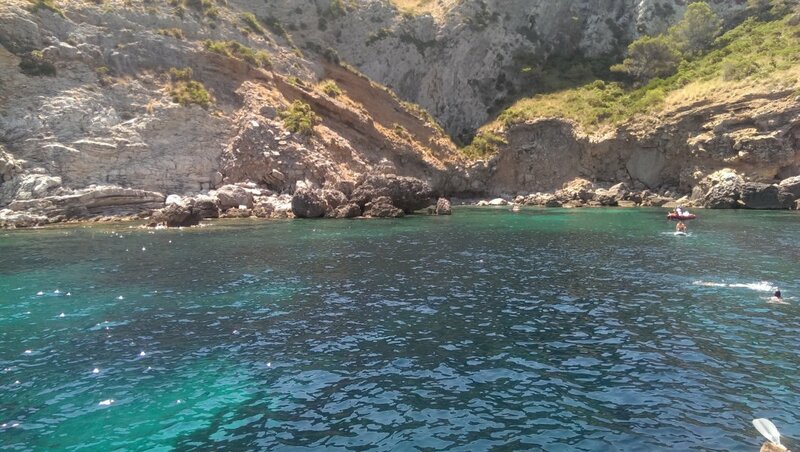 On the opposite side of the peninsula, at Alcanada, where there is a small lighthouse. 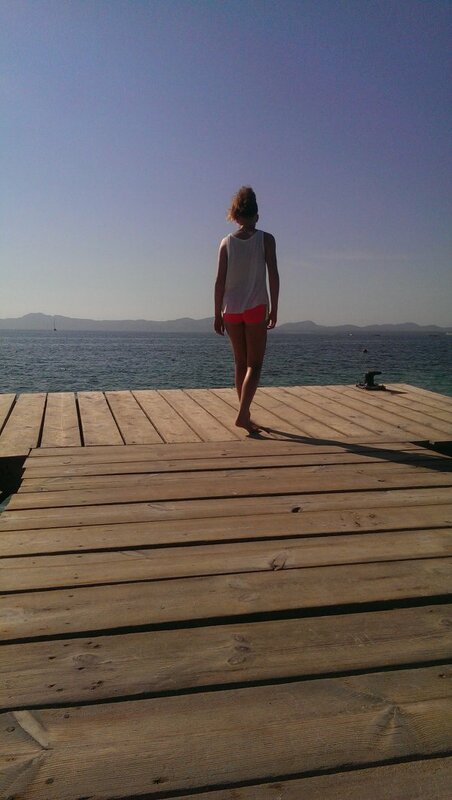 On the other side of Badia d'Alcúdia. 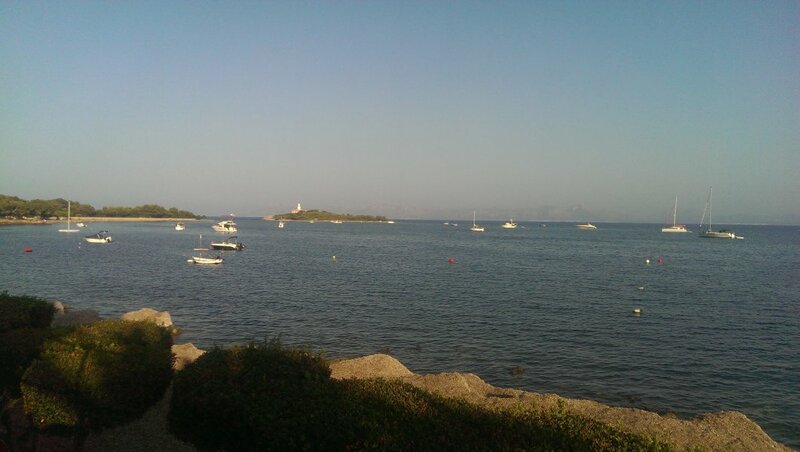 The peninsula on the far side has several hills, with Talia Freda (561 metres) being the tallest, just to the right of the lighthouse island. 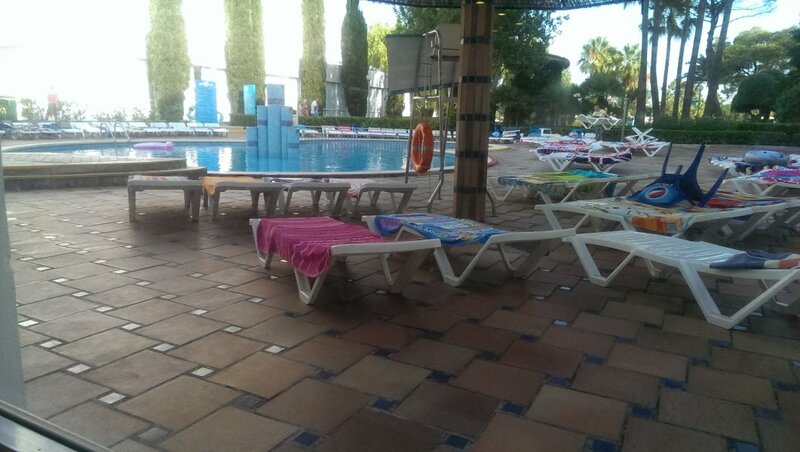 Sunloungers at the hotel pool. Even first thing in the morning, some selfish person will have laid their towel on it to prevent other people from using it (and no, these are not stereotypical Germans, they are Brits). 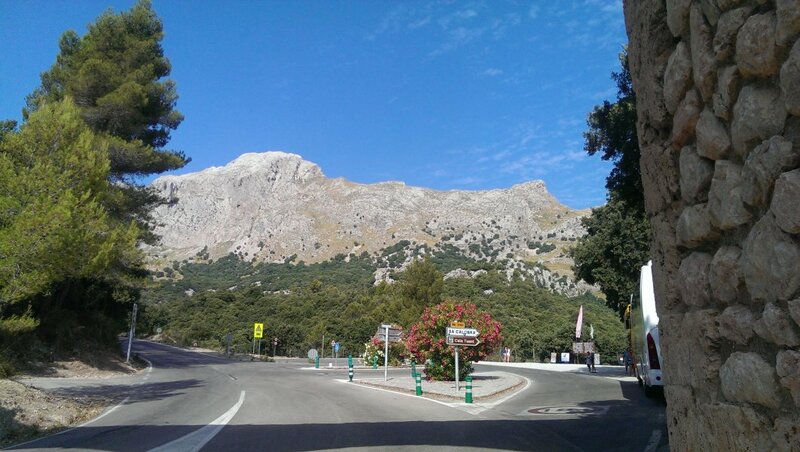 Southeast faces of Puig Caragoler (921 metres) and Puig dels Moles, heading into the Serra de Tramuntana mountains, on a tour of the northern part of the island. 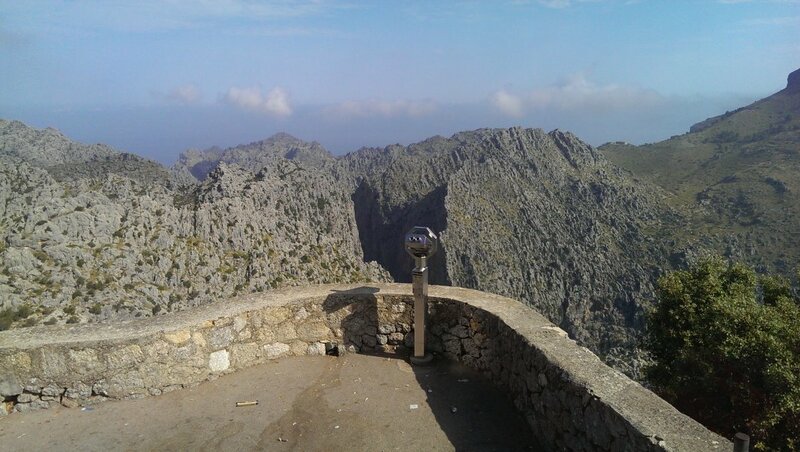 Puig de n'Alí (1035 metres), Puig d'en Galileu (1195 metres), Puig de Massanella (1364 metres - second tallest on the island), Puig de ses Vinyes (1106 metres), Puig Major (1436 metres - tallest on the island), Muntanya de Moncaire (about 859 metres), Es Castellots (about 690 metres). 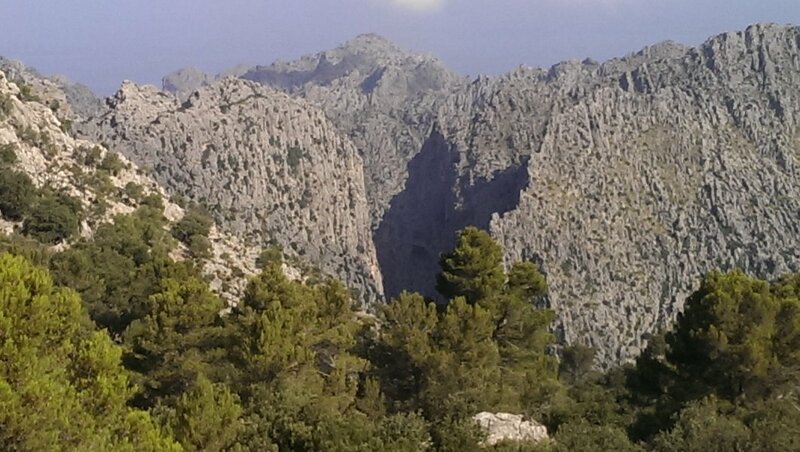 Puig de n'Alí, Puig de Massanella's spikey ridge and Puig d'en Galileu. 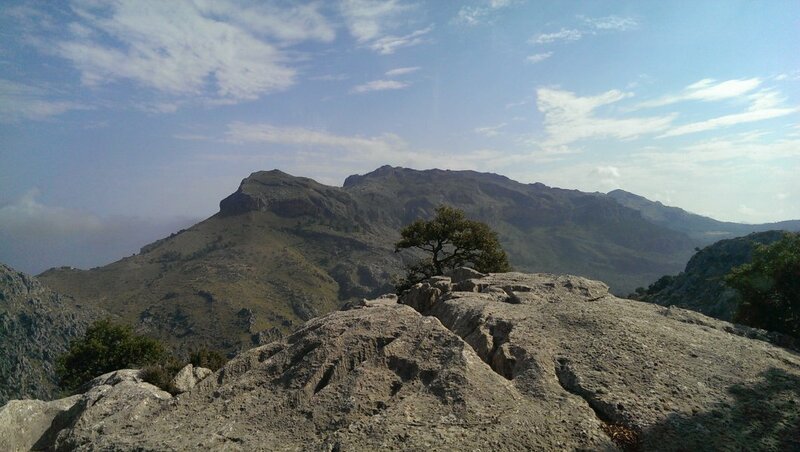 Puig Roig (1003 metres) and Puig Caragoler. 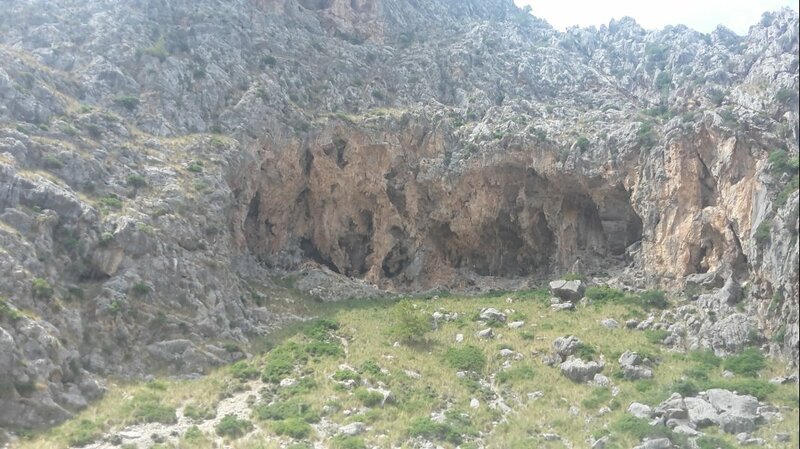 Torrent de Pareis gorge, which must be well over 200 metres deep. The Torrent des Gorg Blau and Torrent de Lluc rivers combine at s'Entreforc to flow down the gorge. 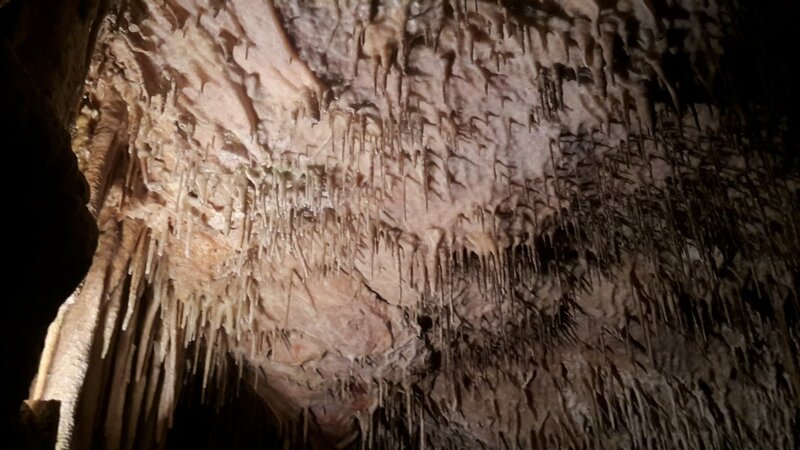 Each part of it has a different name, such as Gorg des Cingles (Gorge of the Cliffs), Gorg des Capellà (Gorge of the Priest) or Gorg de s'Àguila (Gorge of the Eagle). Each of the cliffs have names too, if you want to study the maps. 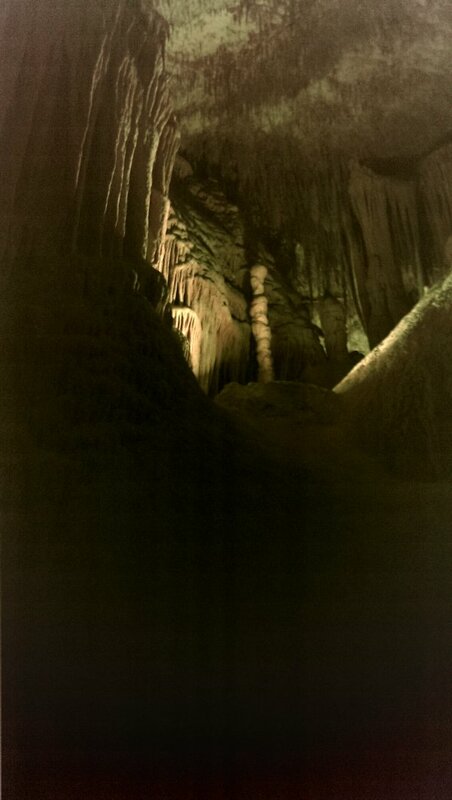 A View to a Gorge. 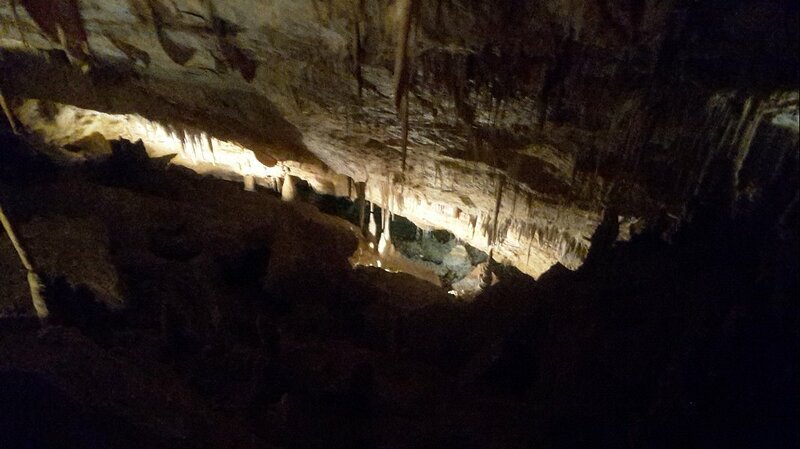 Huge cave entrance in the gorge. Puig de ses Vinyes and Puig Major over the Torrent des Gorg Blau valley. 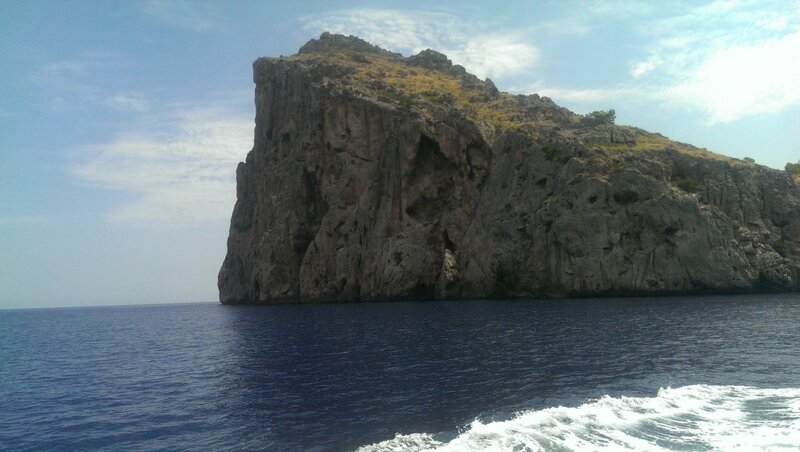 Rock pinnacles at the cliffs of Gorg Blau. Aquaduct from Gorg Blau reservoir to Sa Central reservoir. Puig Major from the aquaduct. 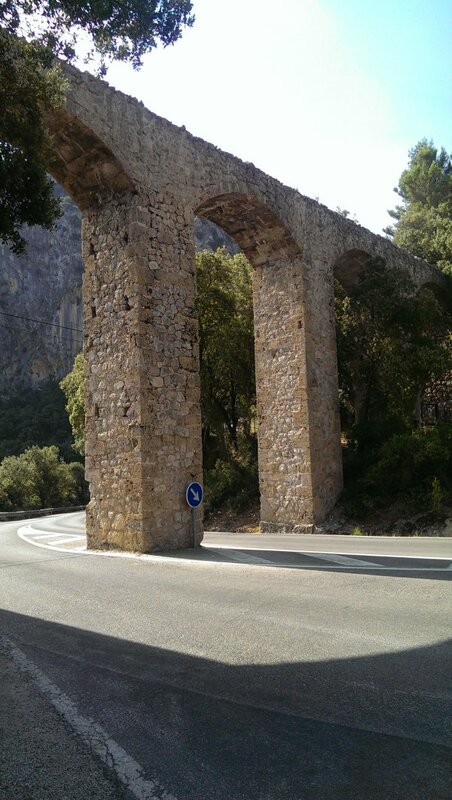 Road climbing up to Coll de Cal Reis. 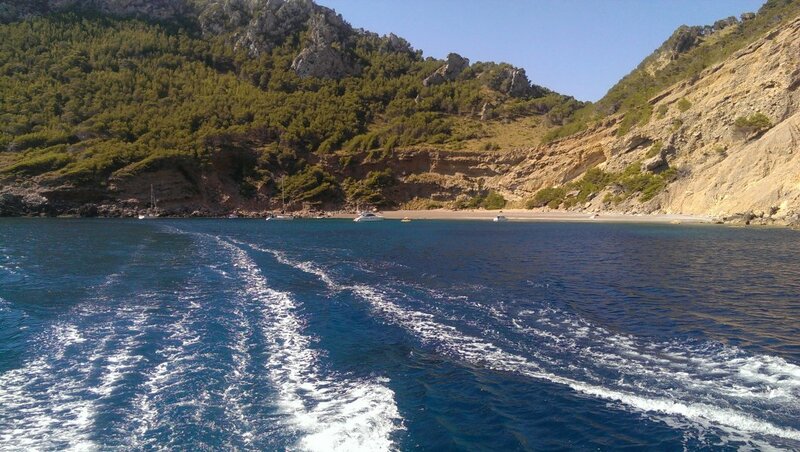 The mouth of Gorg Blau can be seen in the distance, with the pinnacles on the left. 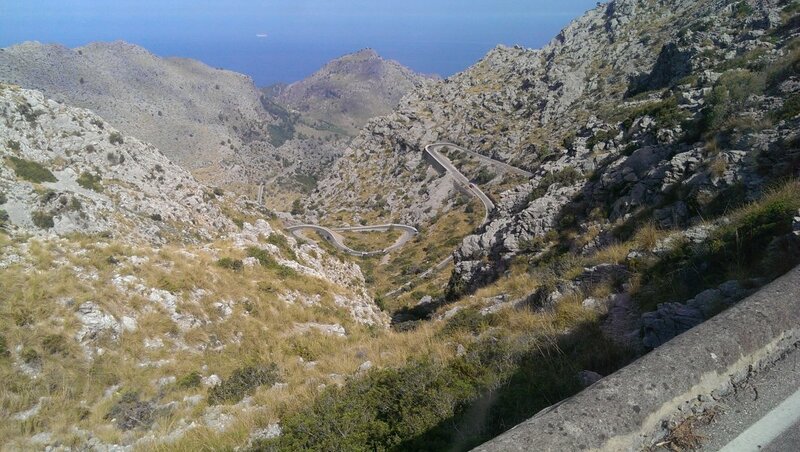 Road descending to Port de Sa Calobra, just below the Nus de sa Corbata (tie-knot) loop. 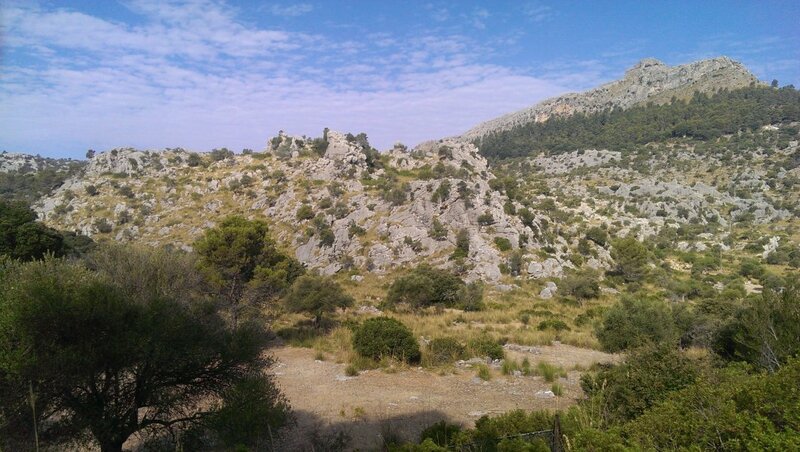 The ridge on the left is Ses Monjoies, and the hill in the distance is Mola de Can Palou (472 metres). 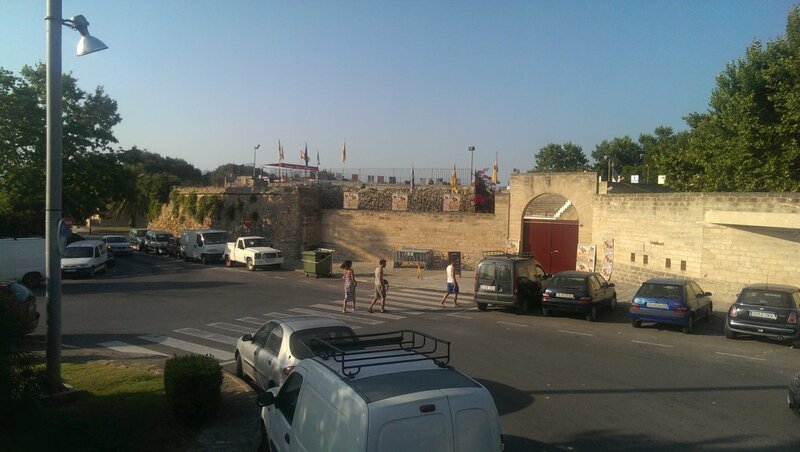 On the right is the edge of Es Castellots. 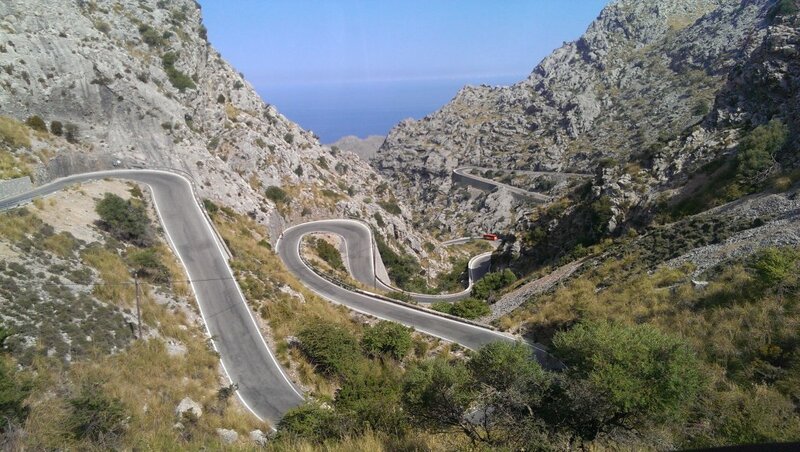 The road descends from about 740 metres altitude to nearly sea level, twisting like this. 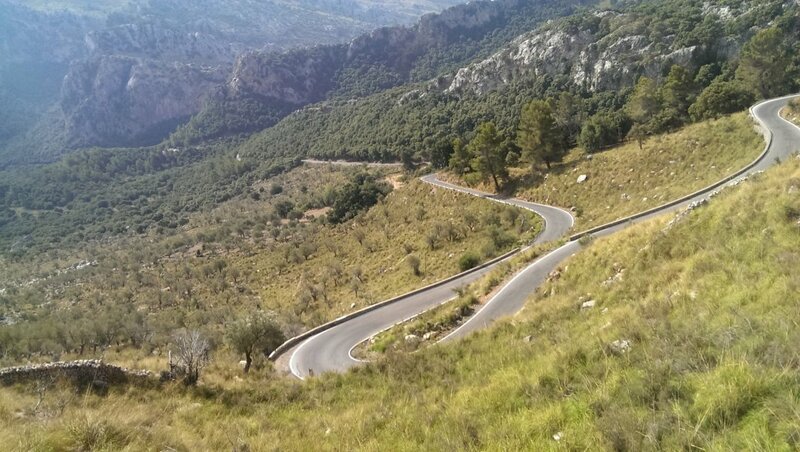 There is only one road, despite how it looks in the picture; the nearby curves connect to the distant hairpin before the road drops down to the bus. The distant hill is Mola de Can Termes. Mola de Can Palou and Mola de Can Termes, with Ses Monjoies on the left. Another 10 bends are needed to get around Ses Monjoies to the road seen ahead - that section actually heads downhill towards the camera. 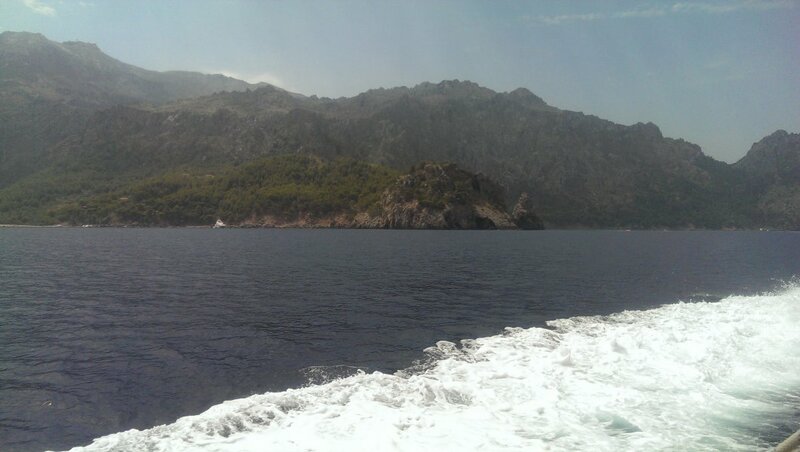 Mola de Can Palou and Mola de Can Termes with Port de Sa Calobra on the right, and Sa Vaca behind it. 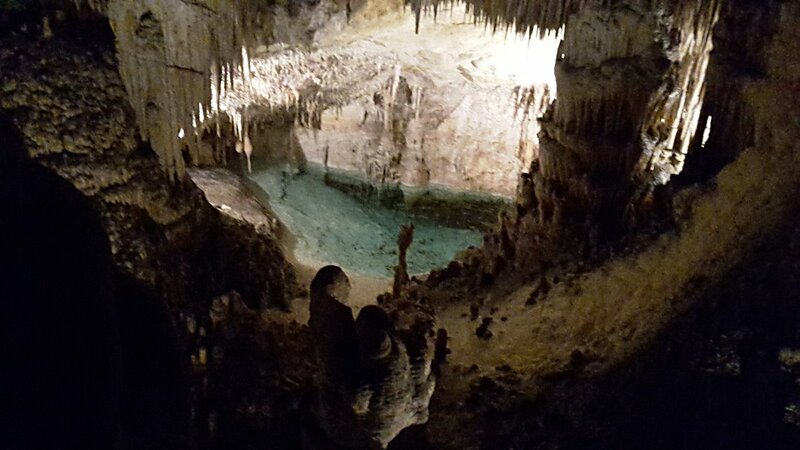 Seen from the viewpoint above Sa Bretxa slot canyon. 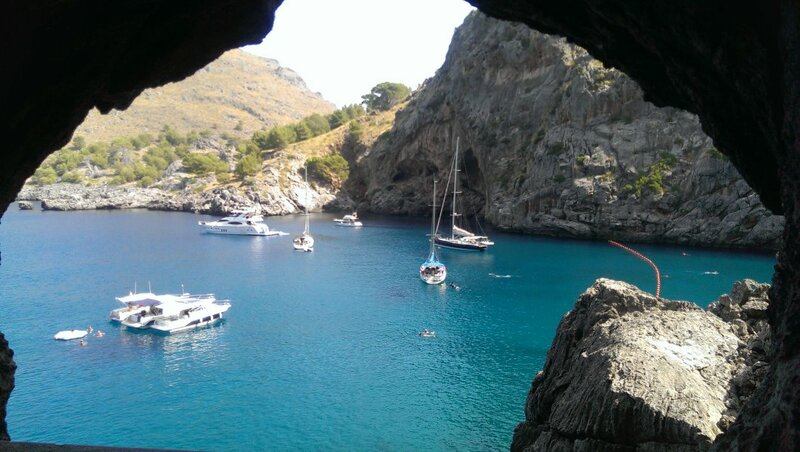 Blue water and Mola de Can Termes at Port de Sa Calobra. 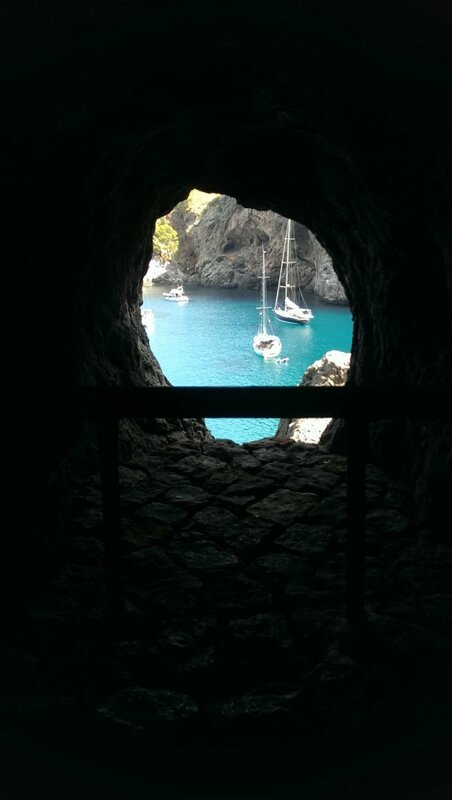 Port de Sa Calobra. The slopes on the right are Es Turmàs. 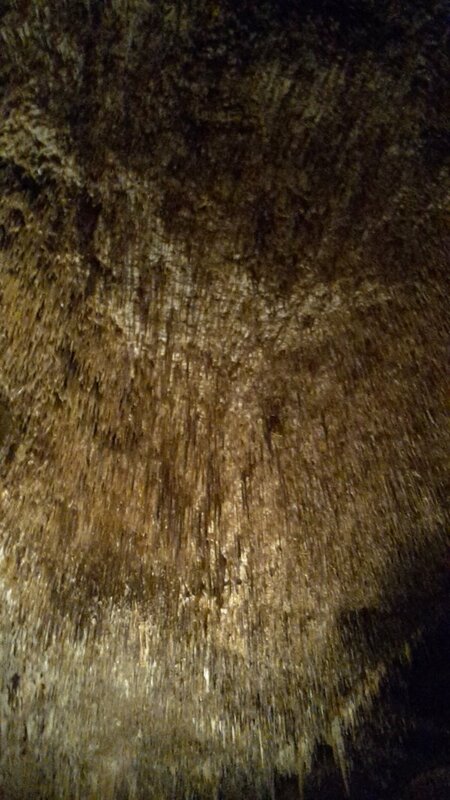 Tunnel to the mouth of the Torrent de Pareis gorge. 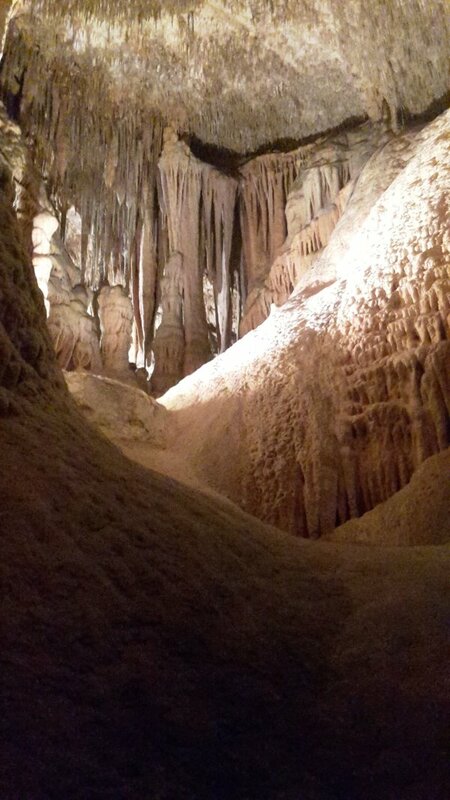 Natural window from the artificial tunnel. 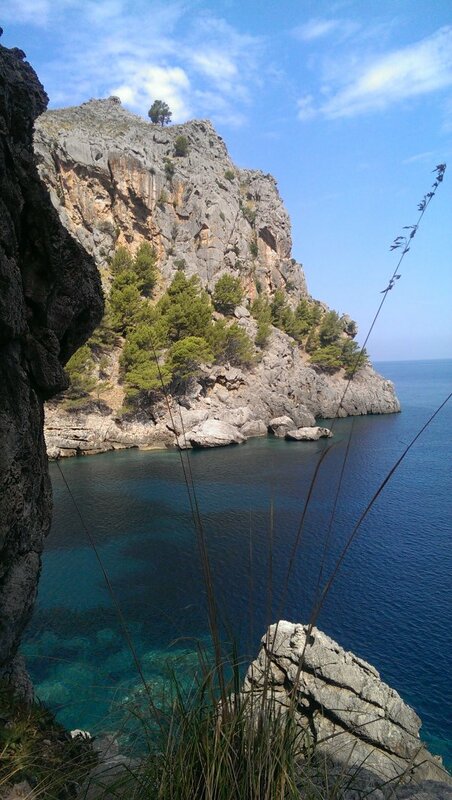 The window looks out into the mouth of the Torrent de Pareis river. 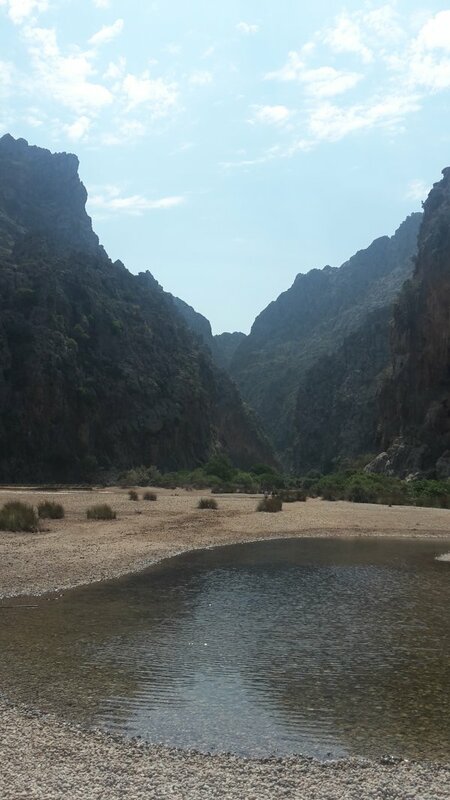 S'Olla (The Pot), the dramatic mouth of the Torrent de Pareis. 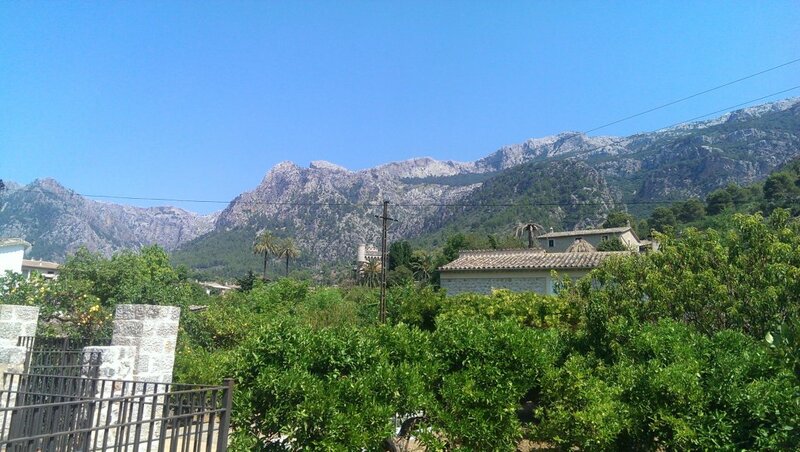 The mountain on the left is Puig de ses Abelles (about 390 metres). 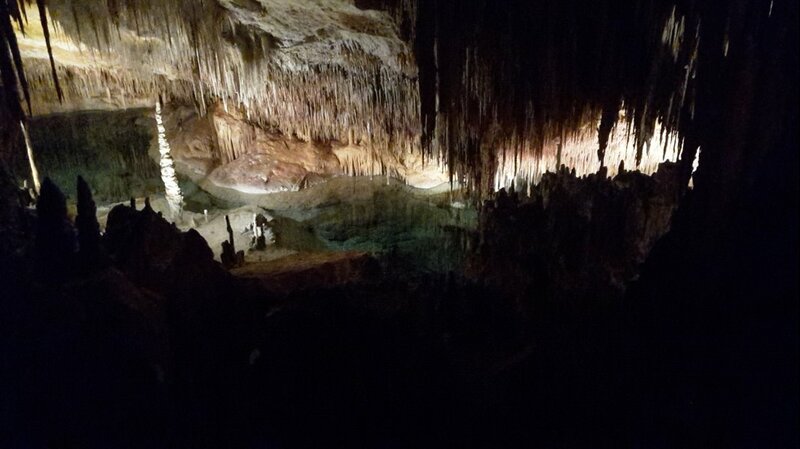 In front of it, a large pool (up against the spiky cliff) is a large pool, which appears to be a major cave resurgence. The gorge heading upstream. At this point, it is known as Gorg Dolç. 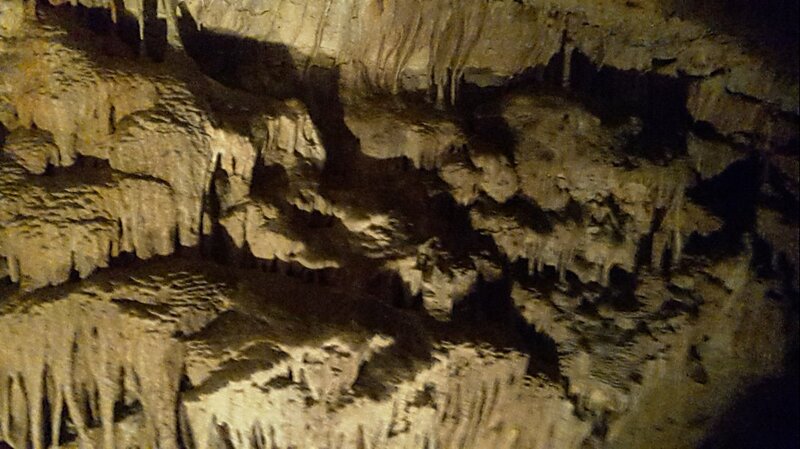 Corroded limestone on the wall of the gorge. 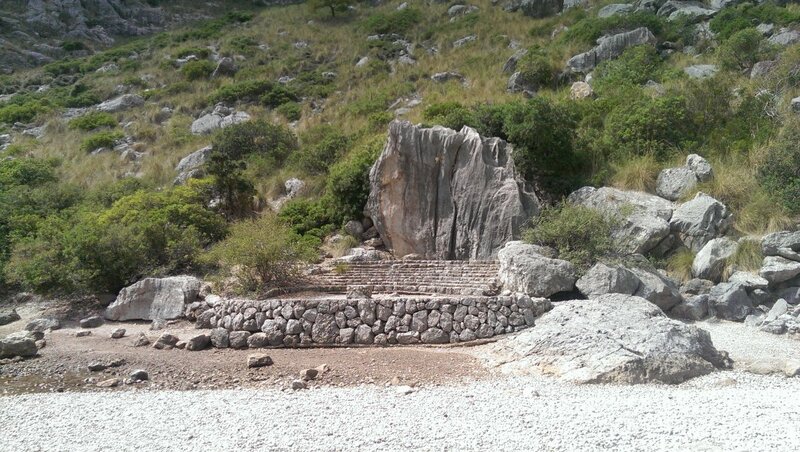 Stone stage at the gorge, a dramatic but odd location for it, since it would require all stage equipment to be laboriously transported there. 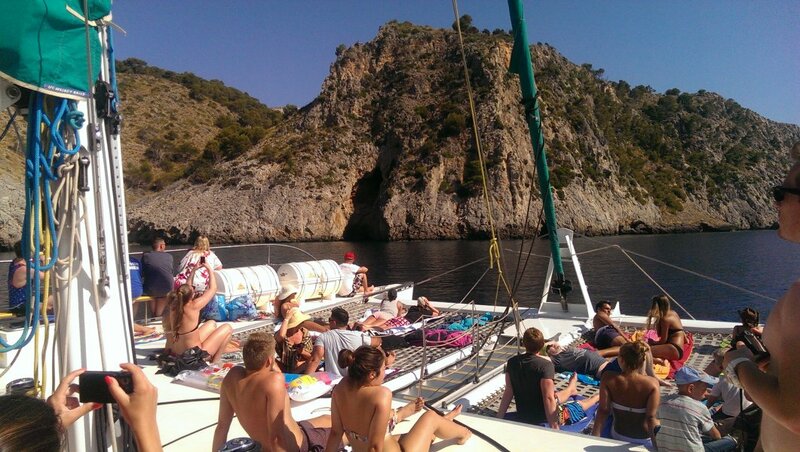 Our tour continued on a boat around the coast. 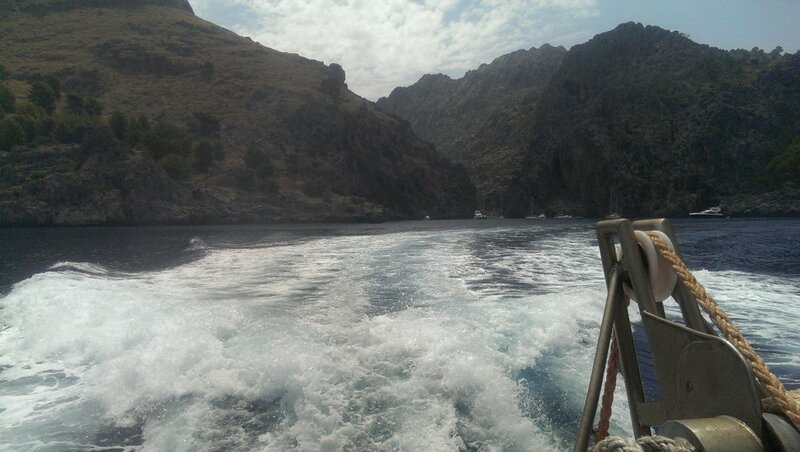 Mouth of the Torrent de Pareis, with the cliffs of Es Castellots on the right. Morro de sa Vaca, looking like the rock of Gibraltar. 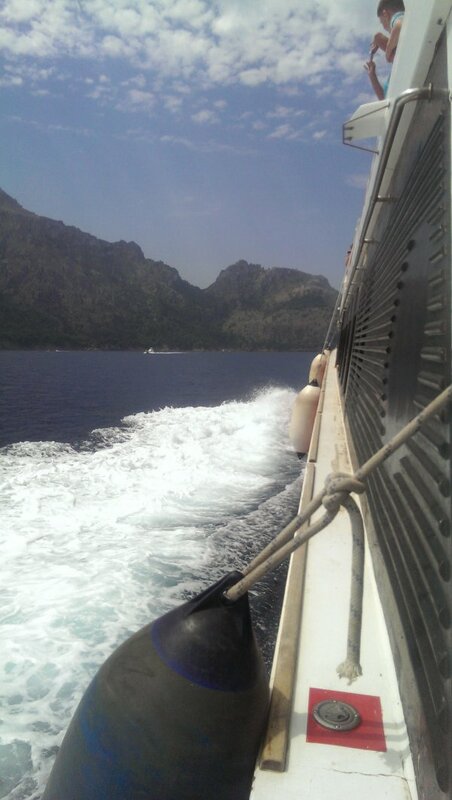 Leaving Port de Sa Calobra. 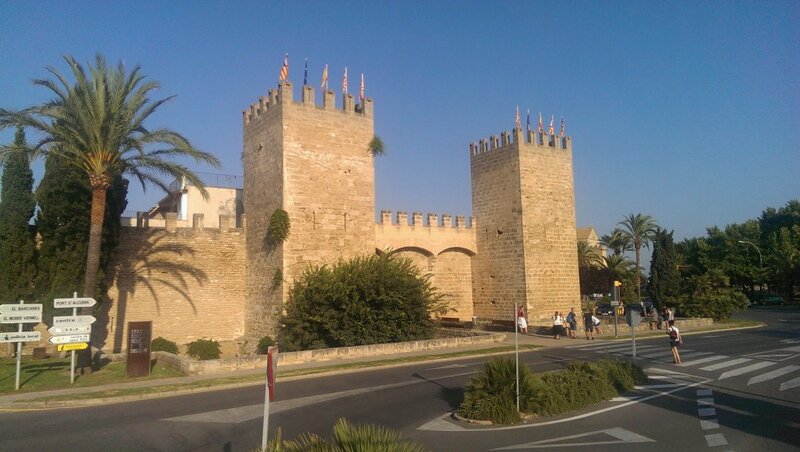 Morro de sa Vaca, Puig Roig, Es Turmàs, Es Castellots. 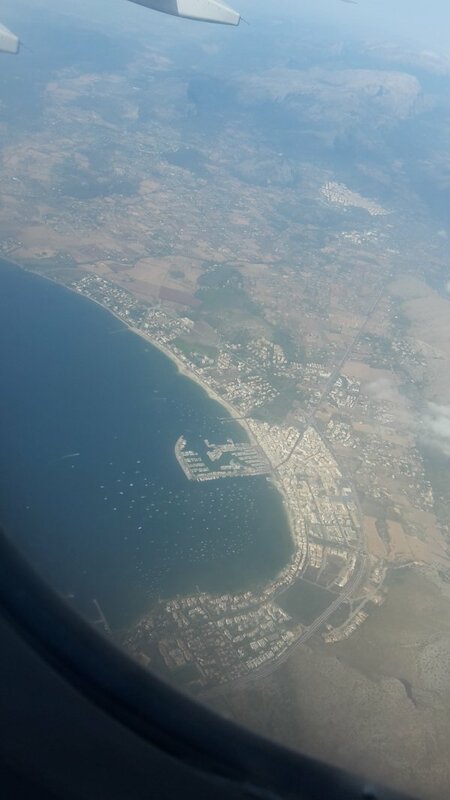 Mola de Can Palou and Mola de Can Termes, with Ses Monjoies on the right (actually taken from further down the coast - picture is not in the normal sequence). 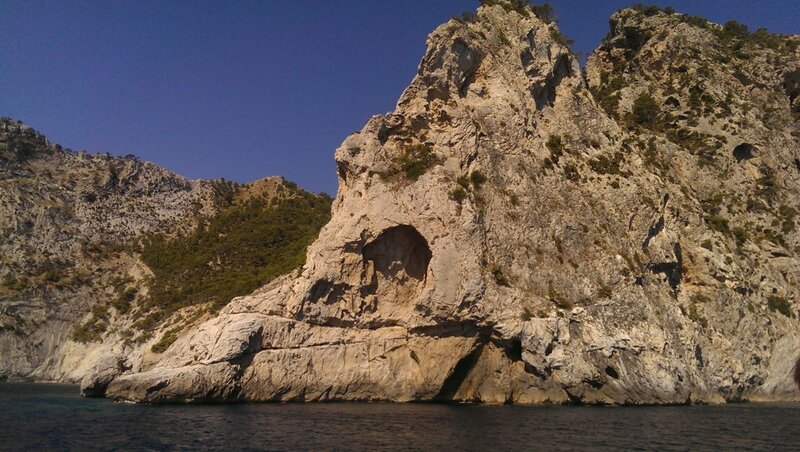 The small Morro des Forat peninsula. 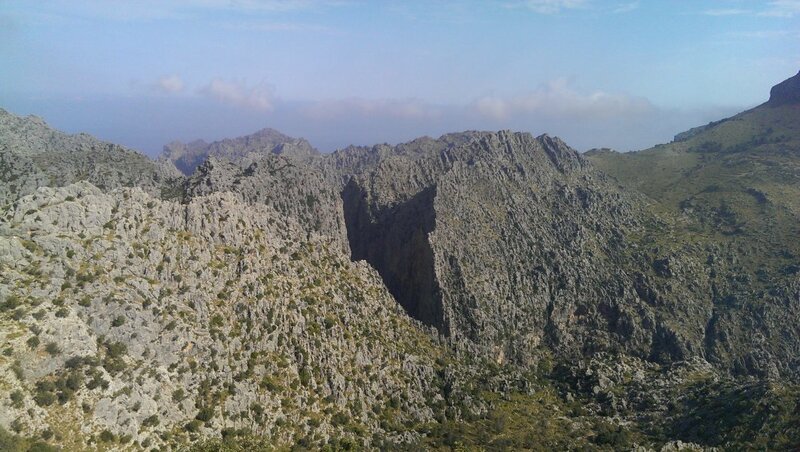 Behind it are Puig Major, Muntanya de Moncaire and Torre de na Seca. 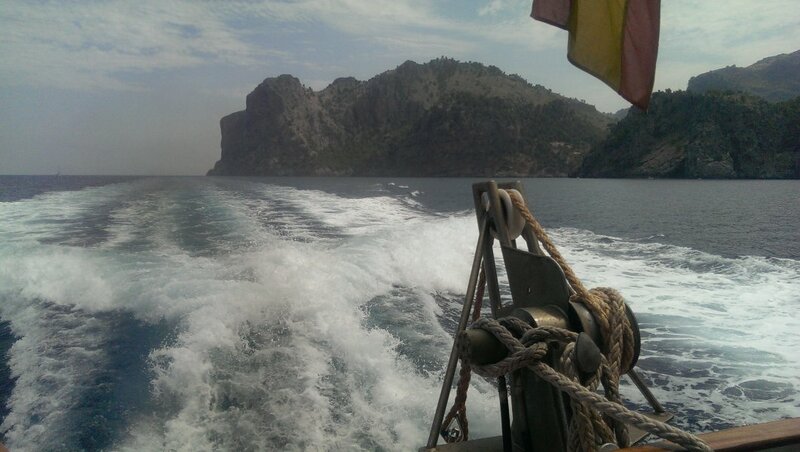 Heading towards Port de Sóller, with Torre de na Seca. Port de Sóller. 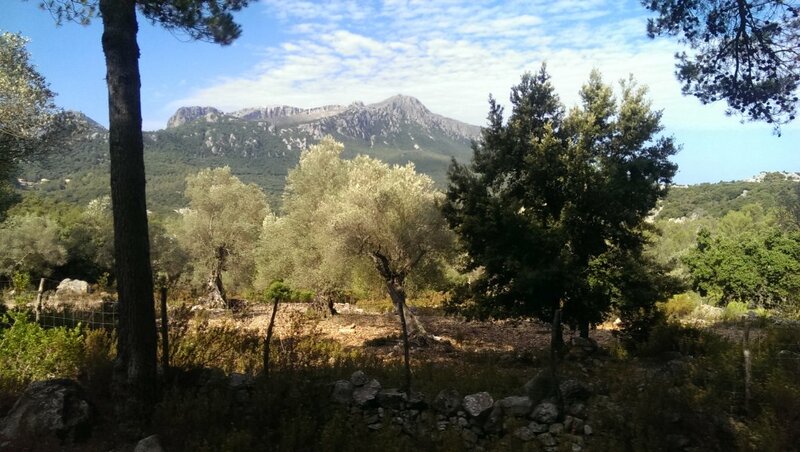 The mountains are Sa Mola, Puig de s'Aritjar (1021 metres), the Puig des Vedell ridge of Puig des Teix (1064 metres) and the green ridges of Serra de Muleta. Bottle opening phalli in Port de Sóller. 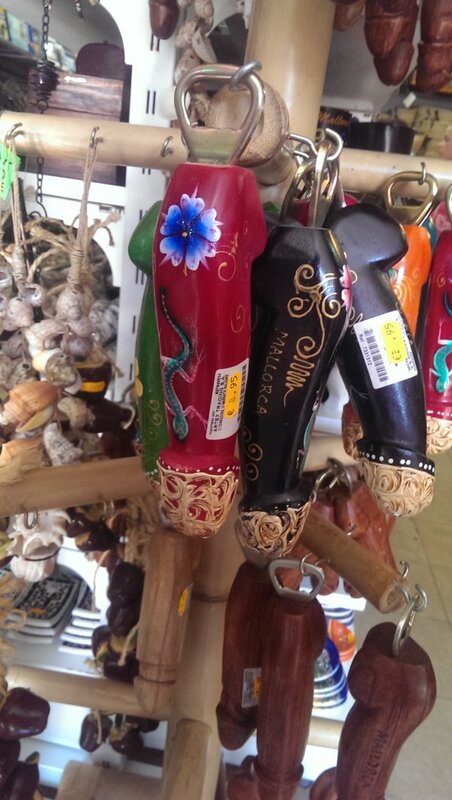 Just your average souvenir. 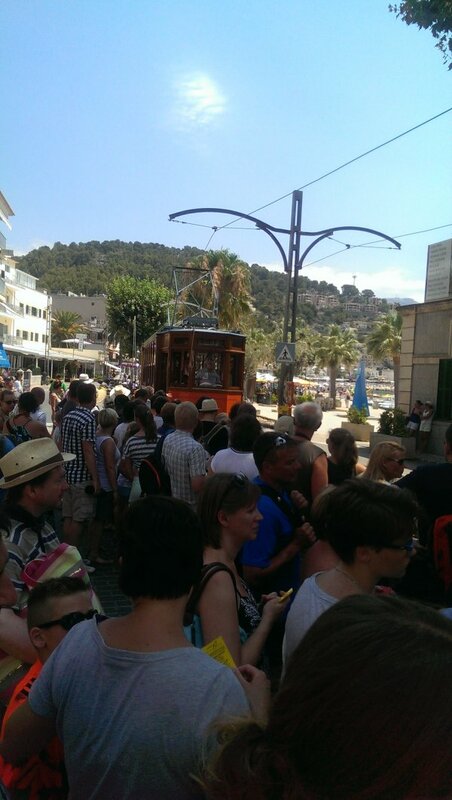 Heavy crowd waiting for the tram in Port de Sóller. 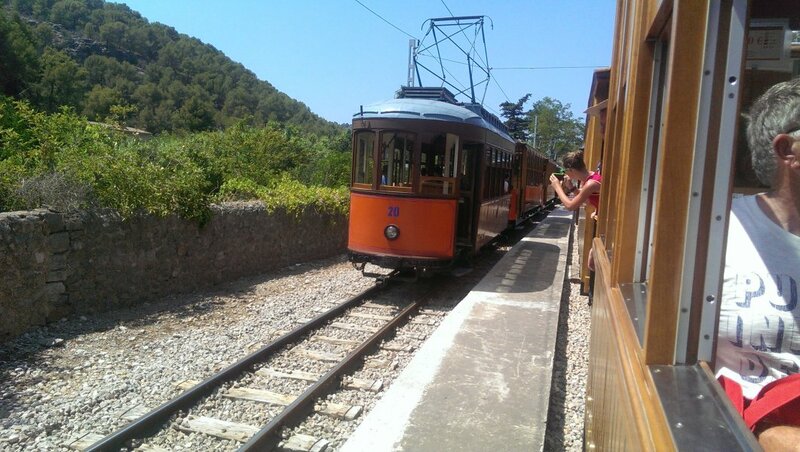 Passing trams outside Port de Sóller. 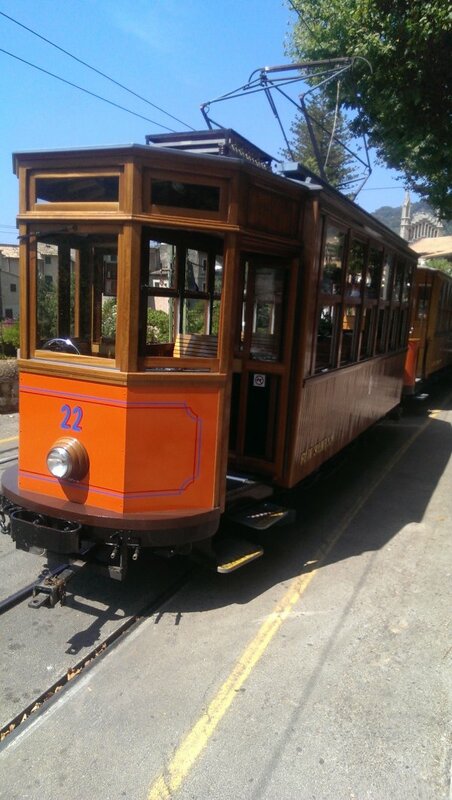 Leaving our tram in Sóller. 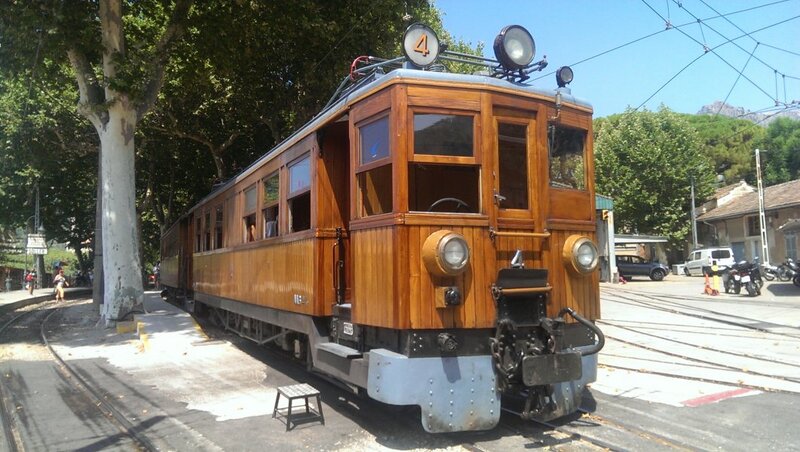 Switching to a train in Sóller. 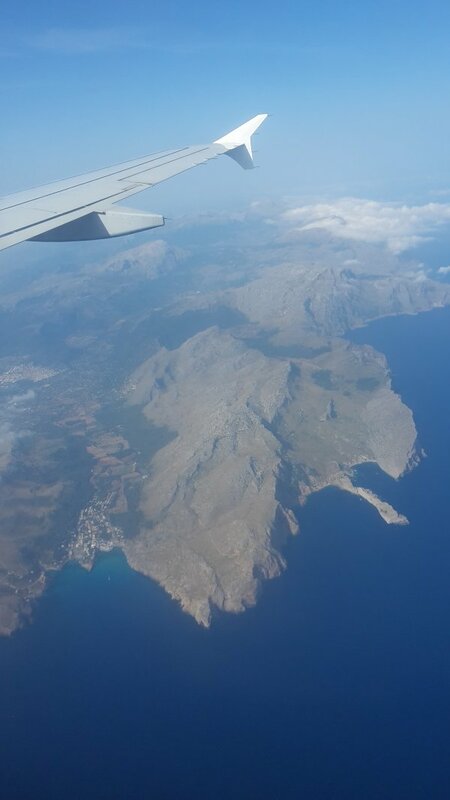 Sa Regana (1030 metres), Puig des Verger (974 metres), Es Cornador Gran (953 metres), Sementer Gran (1013 metres) and Puig d'Alfàbia (1067 metres), towering over Sóller. 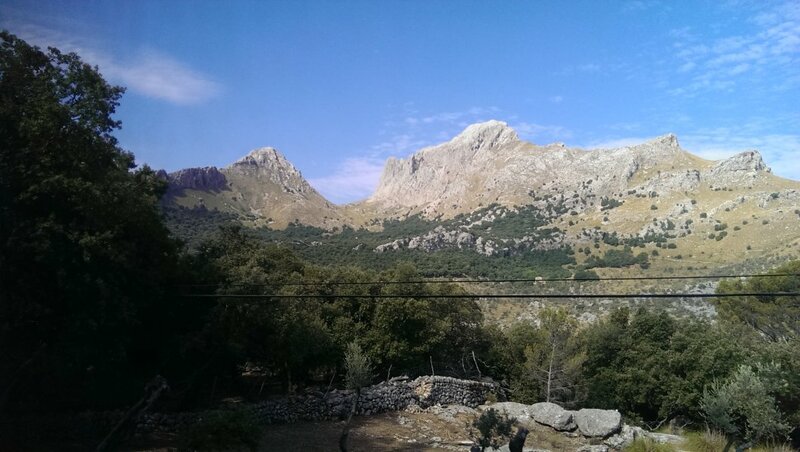 Panorama over Sóller (manually stitched from two pictures taken 600 metres apart between railway tunnels). Puig de Bàlitx (580 metres), the tip of Muntayeta de Bàlitx, a green lump, Puig de la Bassa (819 metres), the crags of Puig del Senyor Nofre (860 metres), Penyal des Migdia (1356 metres and 1398 metres, not counted as the second tallest mountain for some unknown reason), Sa Regana (1030 metres), Puig des Verger, Puig de l'Ofre (1091 metres), Es Cornador Gran (953 metres), Sementer Gran and Puig d'Alfàbia. Santa Maria church tower in Sineu, in the middle of the island. Porto Cristo harbour, on the southeast coast of the island. 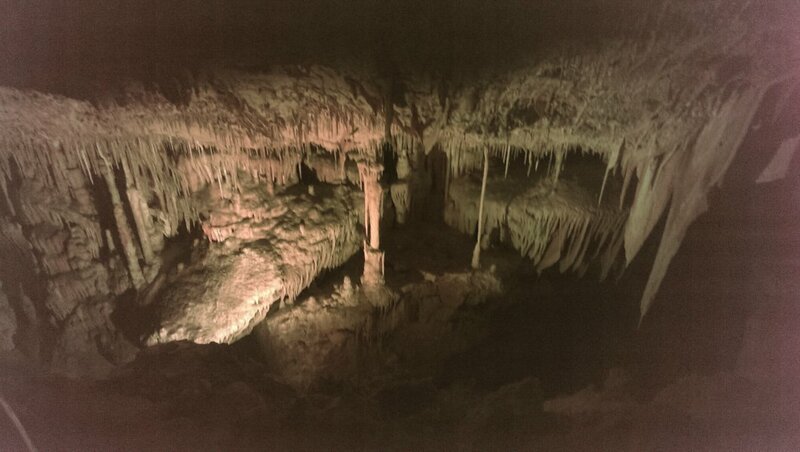 Heading into Cuevas del Drach showcaves at Porto Cristo. 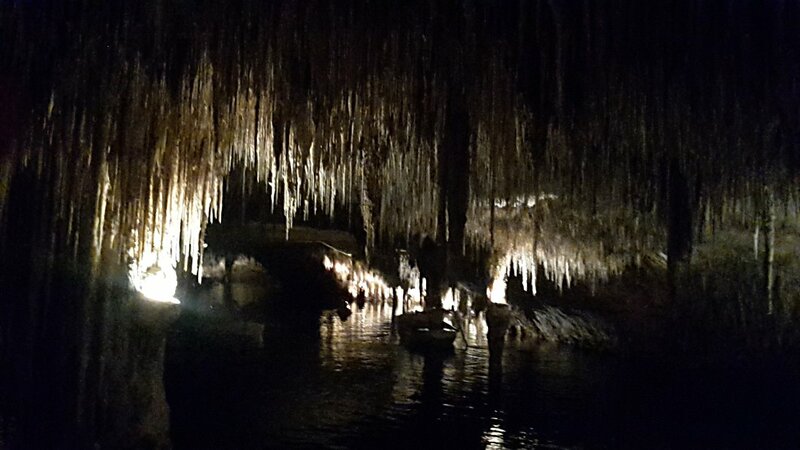 These were originally described in 1338, with two caves explored properly in 1880, connected with two more caves to form the current system by Martel in 1896. 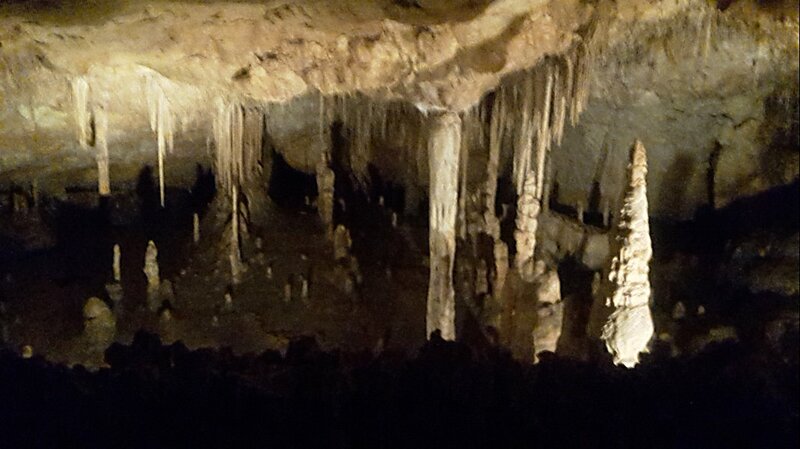 Columns and stalactites. A little fuzzy. 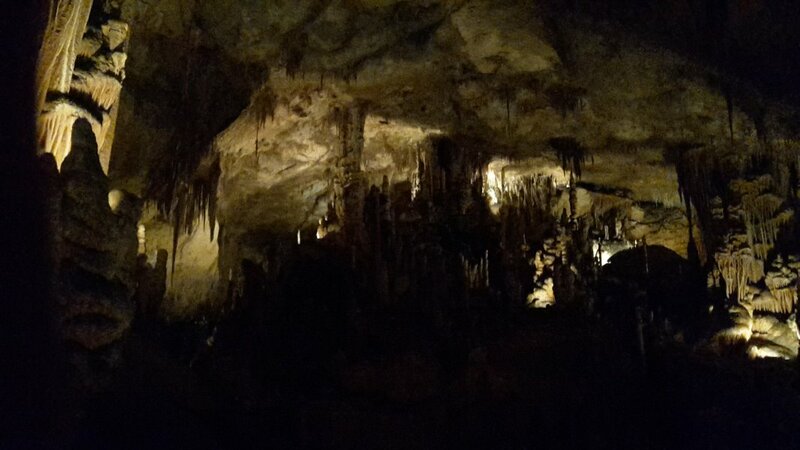 As with all pictures in this gallery, this was taken with a phone camera, which doesn't cope well with low light. 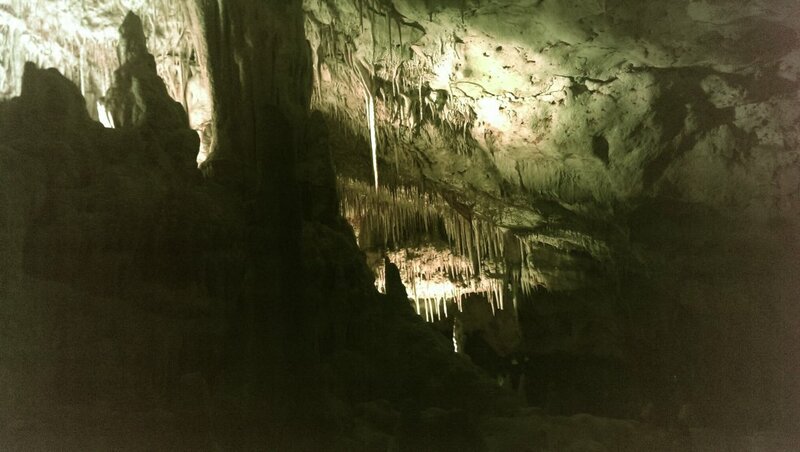 Colums and stalactites. 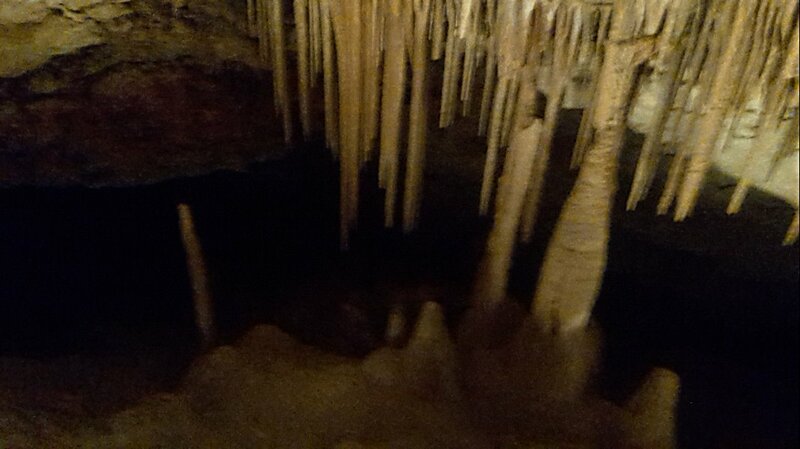 The camera failed badly with this picture, detecting almost no blue. This is after some work has been done to recover the picture. 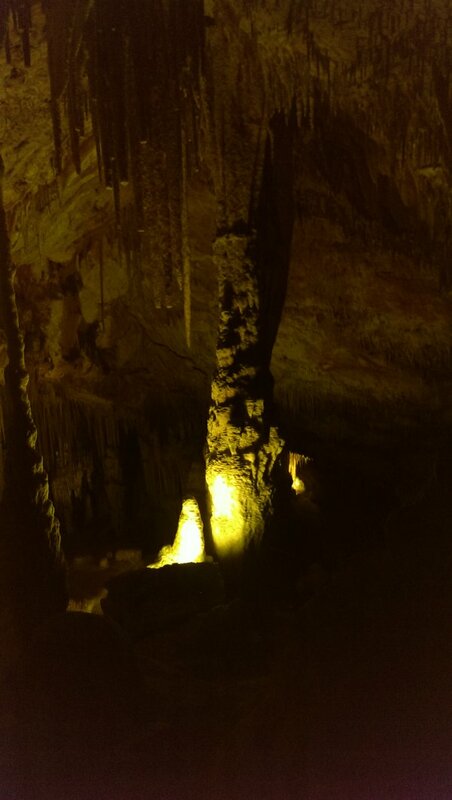 Large column in a chamber. 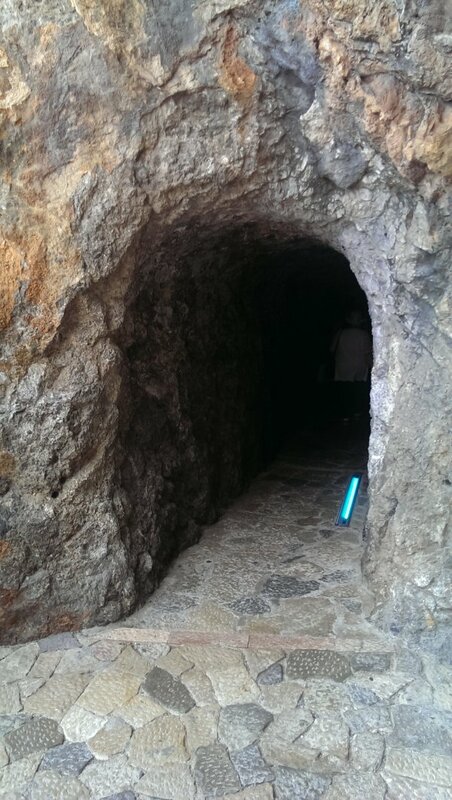 The camera failed again, trying to brighten dark areas, and instead washing the whole picture in bright blue. This picture has had a lot of work to recover it, and the effect is still far from perfect. It is what it is. 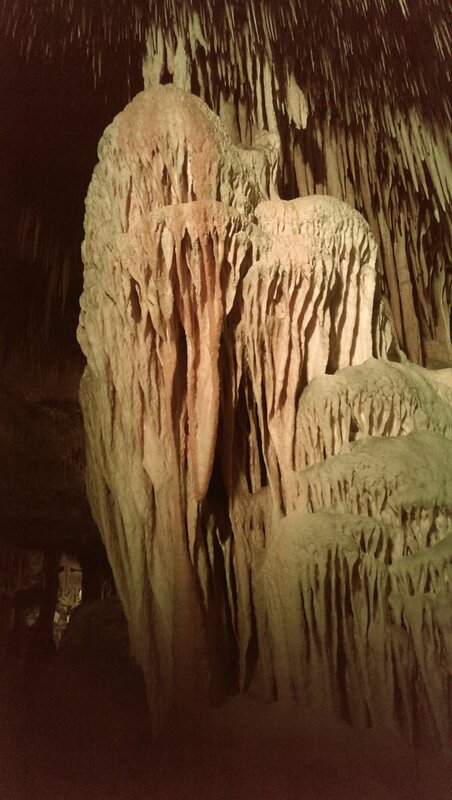 Column chamber, also recovered from a blue washed picture. 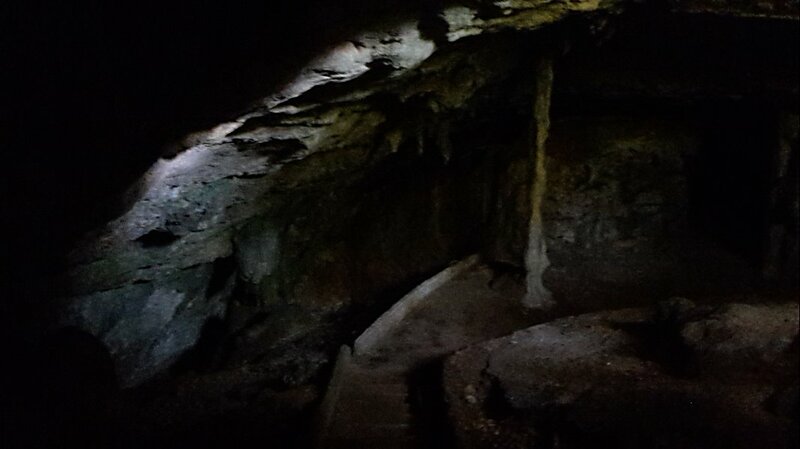 Descending the sloping wall of the chamber, where the path zig-zags down to reach the bottom of the cave. 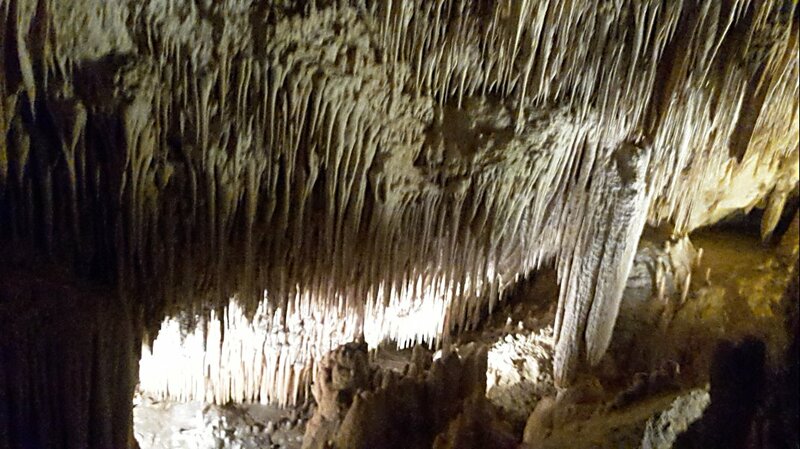 Stalactites showing false floor development - the water appears to have ponded here in the past, causing the stalactites to spread sideways where they touched the water. 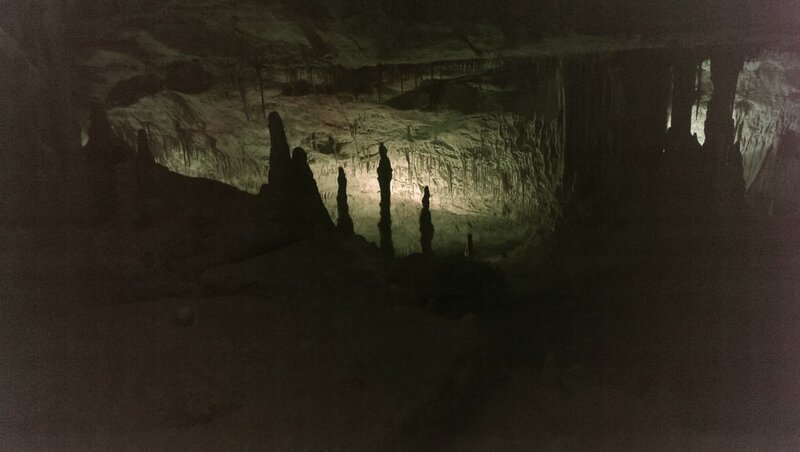 Stalagmites and columns. Another recovered blue-washed picture, not very successful. 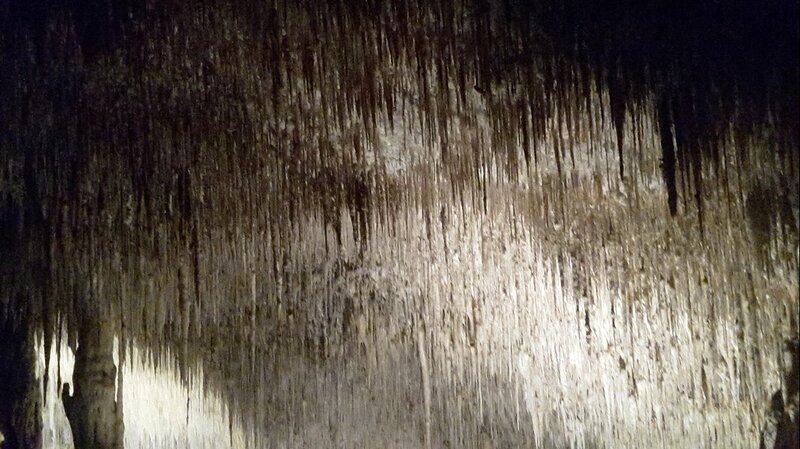 Beautifully white stalactites, following the cracks in the ceiling. 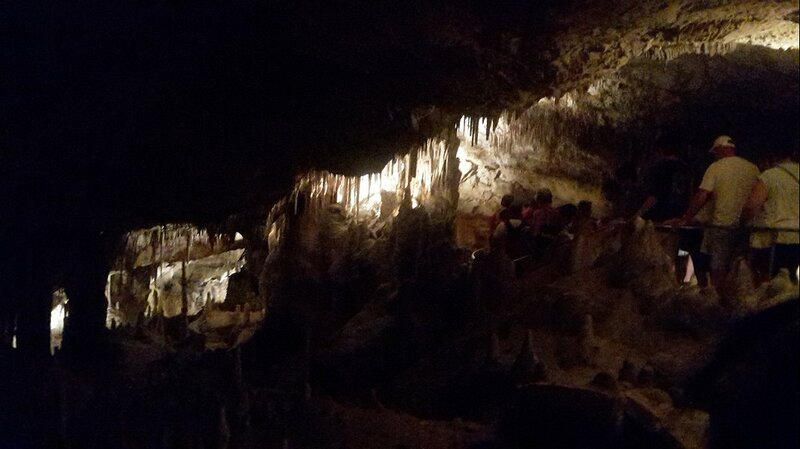 The path zig-zagging down around the stalagmites. Little column in an alcove. Another blue-wash recovery. Forest of short straws. Best not to pick them. 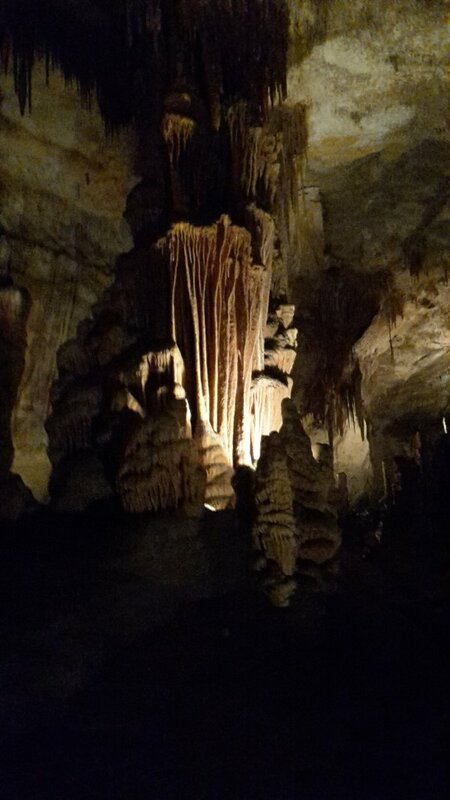 Column, flowstone and curtains. Another blue-wash recovery. 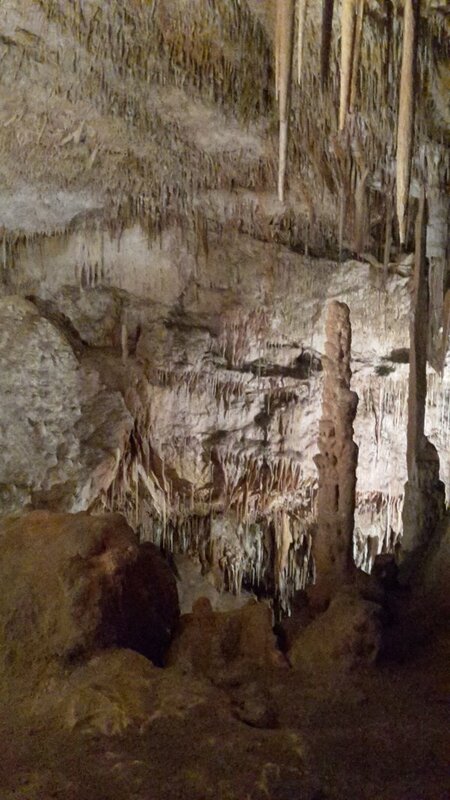 Stalagmite and flowstone. Another blue-wash recovery. Tightly packed curtains. Another blue-wash recovery. Translucent curtain fragment showing iron stained bands. 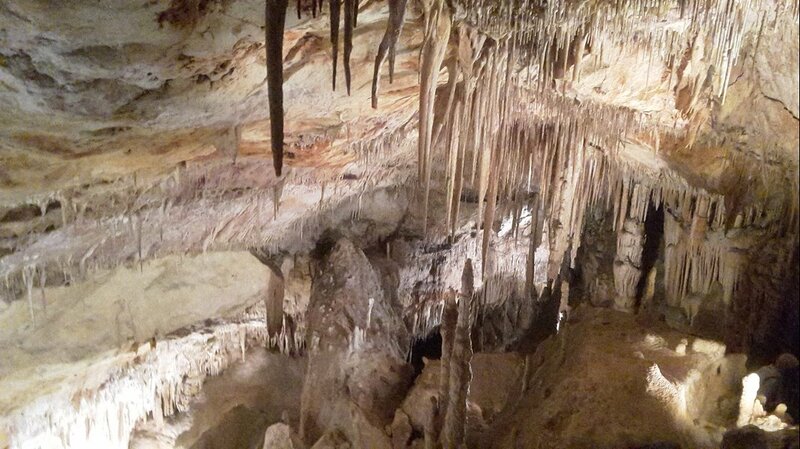 Crystal pools adorned with stalactites and stalagmites; the classic view of this showcave. Up close with the densely packed straws - it almost looks like fur. 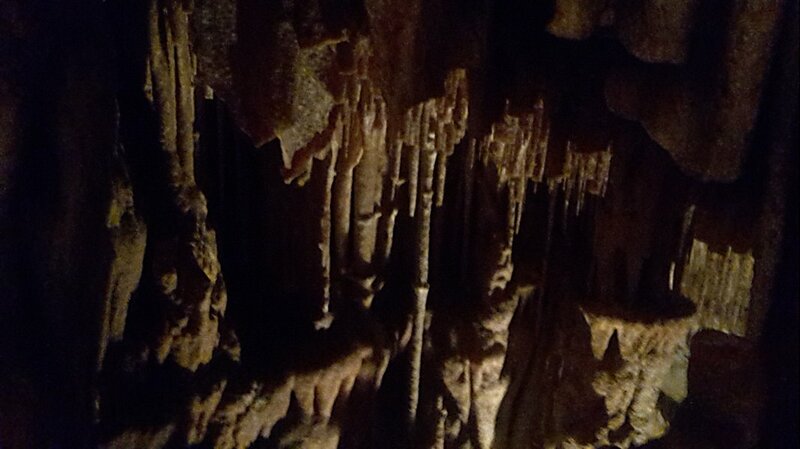 Densely packed stalactites and columns. 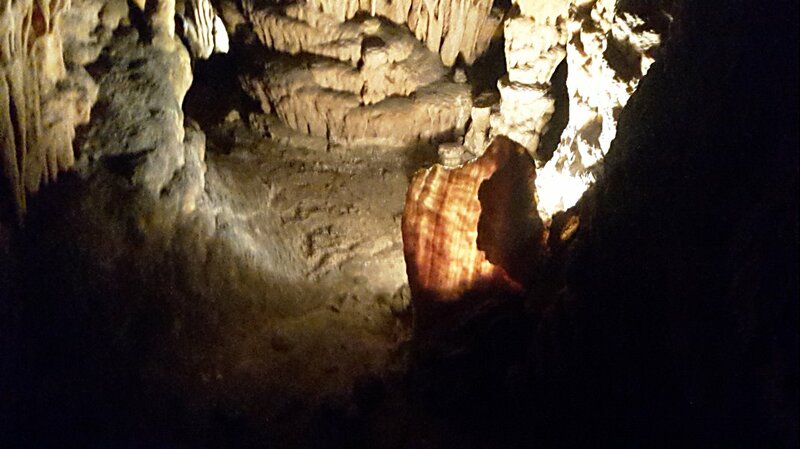 Flowstone and curtains. Although this is a recovered blue-washed picture, the colour of the stal, including its salmon streak, is quite realistic. Tall, thin columns. A recovered yellow-washed picture (the striping at the bottom is a bad effect created by the camera, visible once the blue-wash is removed). 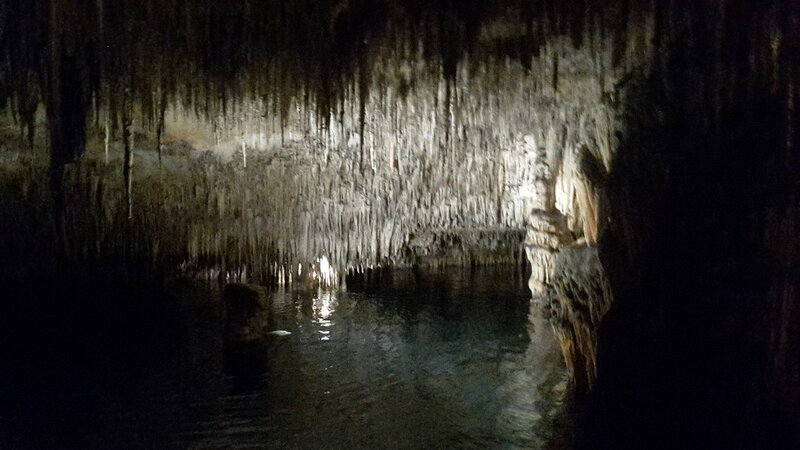 Martel Lake, at the bottom of the cave. 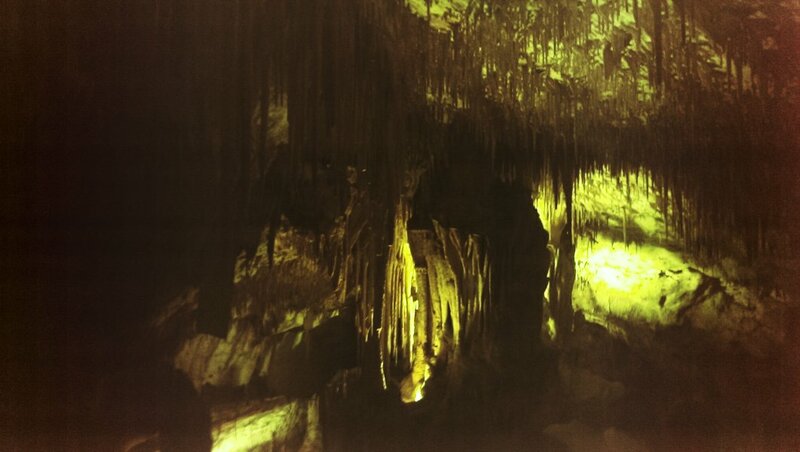 The cave's total depth is only 25 metres, presumably to the bottom of the lake. Martel Lake, 115 metres long and 30 metres wide. For scale, see the rowing boat. At this point, there is a 4-piece orchestra playing in a boat, followed by boat rides on the lake. This causes a large queue to build up, as 60-100 people in front of you also want to watch the orchestra and go on a boat ride. Because of this, the package tour took too long, and we had to leave without a boat ride, because the bus was due to leave. Lonely pillar near the exit. 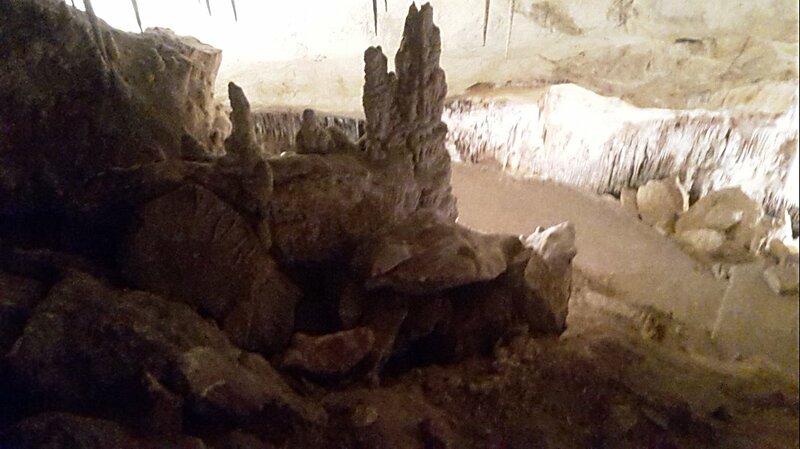 Considering how many hands must have gone past this over the years, its amazing that it is still here. 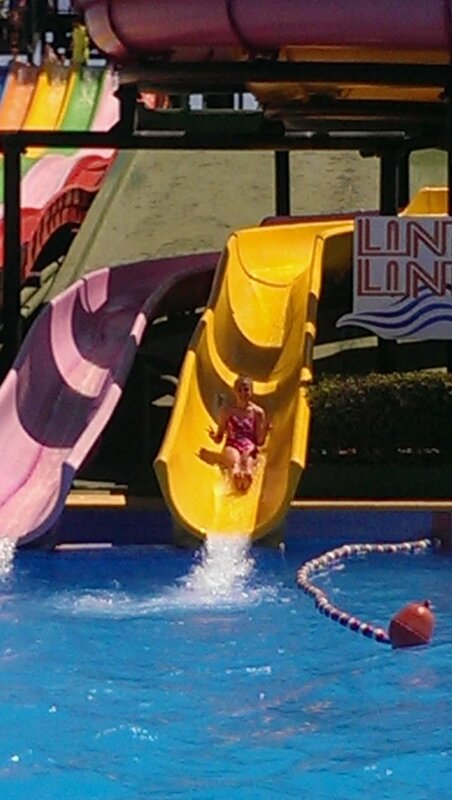 Back at the Alcúdia Hydropark. 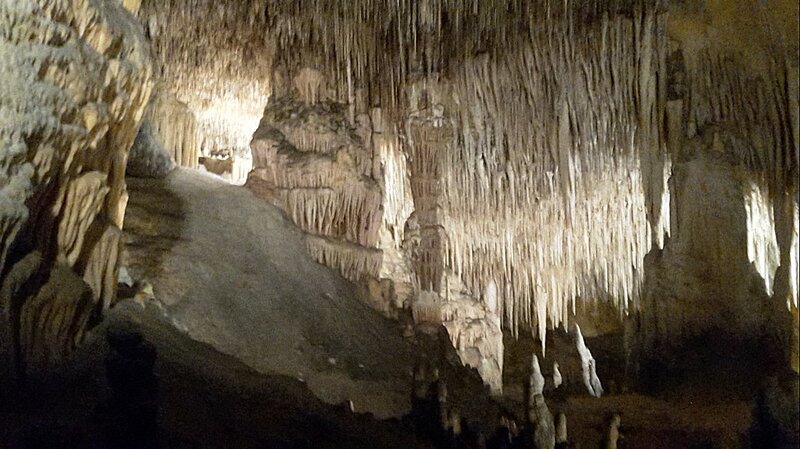 We also visited another one near Palma, but have no pictures. I can sense your disappointment. 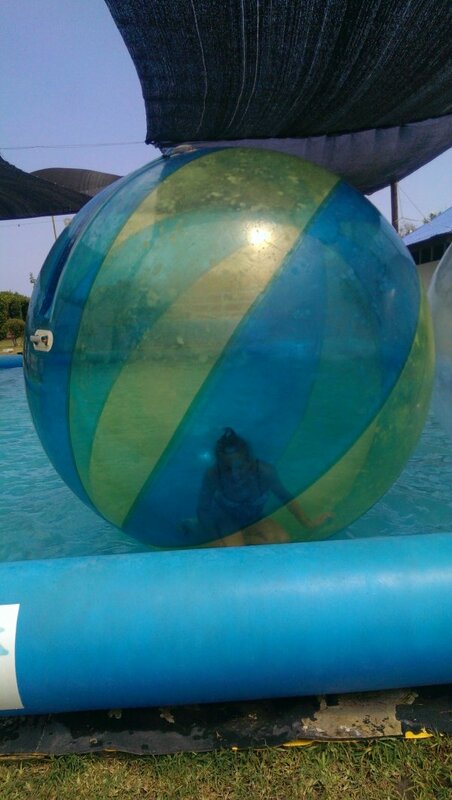 Trapped in a bubble, without any fresh air. This is how you avoid the germs in the pool water. Northern Port d'Alcúdia pier in Badia d'Alcúdia. The peninsula containing Talia Freda. 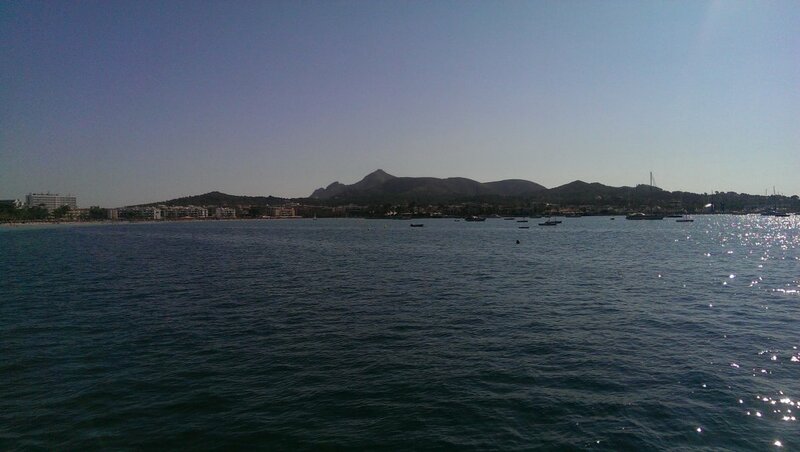 Alcúdia Peninsula, which we sailed around on a catamaran. Looking back towards the lighthouse. 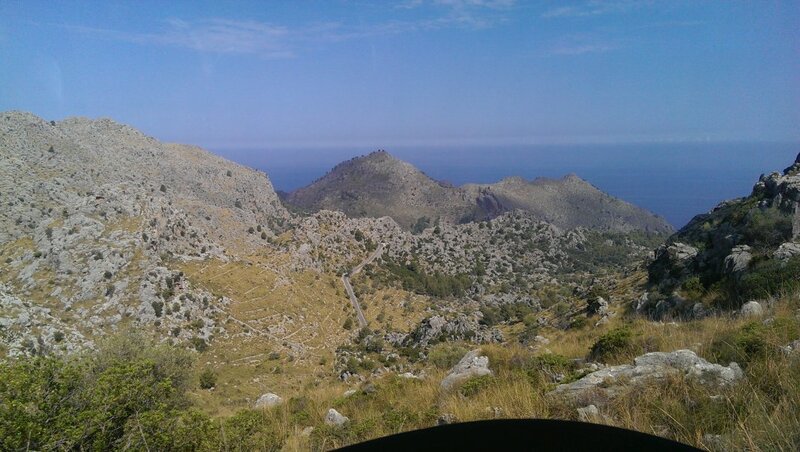 The distant mountains on the left are Puig dels Tossals Verds (1118 metres), Puig de Massanella, Puig d'en Galileu, Puig Tomir, Puig Roig and Puig Caragoler. 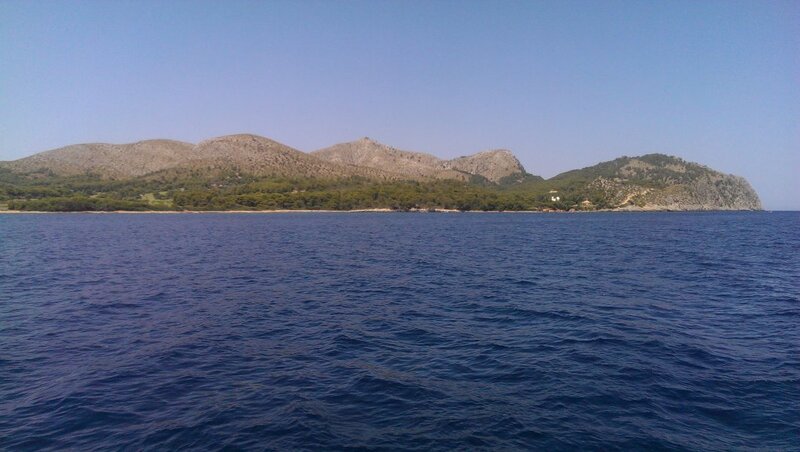 In front of them are some small hills behind Port d'Alcúdia, of which the highest is Puig de Son Fe (264 metres). 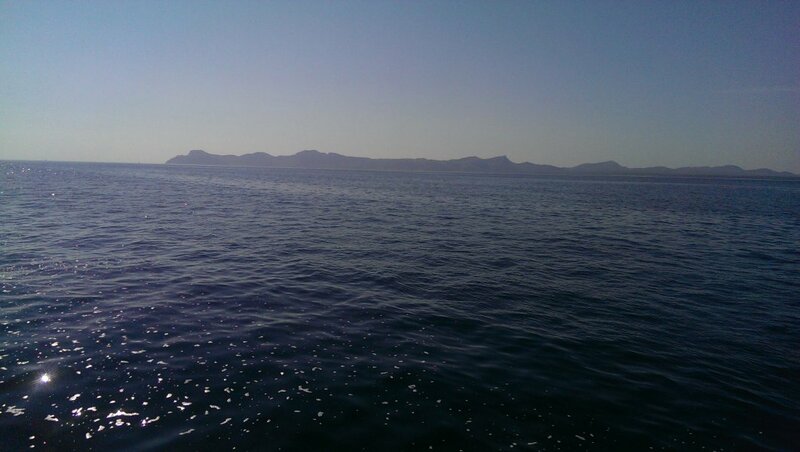 On the right is Puig de sa Madona, on the Alcúdia Peninsula. 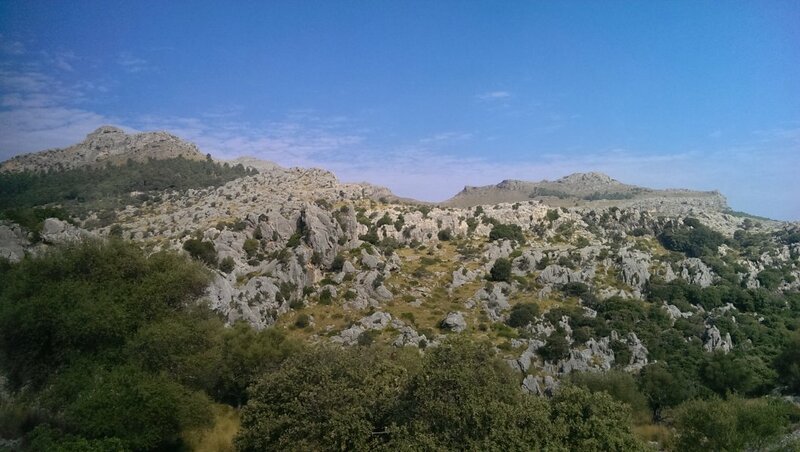 Hills of the southern side of the Alcudia Peninsula: Es Pujadors, Puig d'en Vauma, Talaia d'Alcúdia, Puig des Boc and Sa Teula. 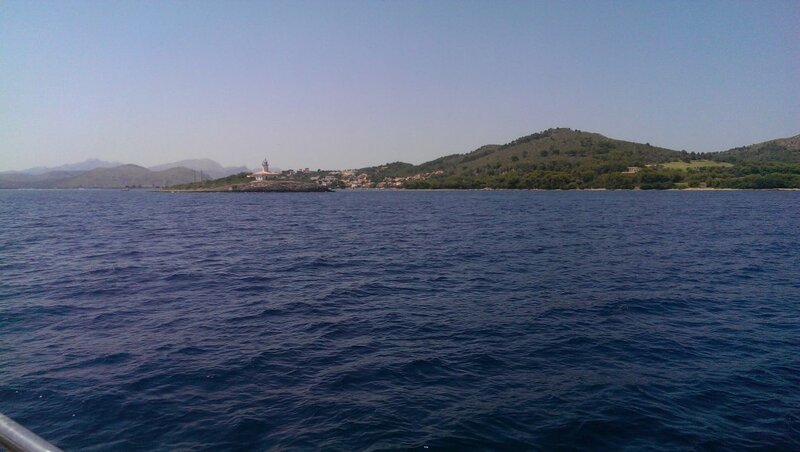 Motoring past Puig Negre (we sailed on the return). It would have been nice to try resting on the cooler netting, but you snooze, you lose. Crumbling cliffs and beach at Platja des Coll Baix. 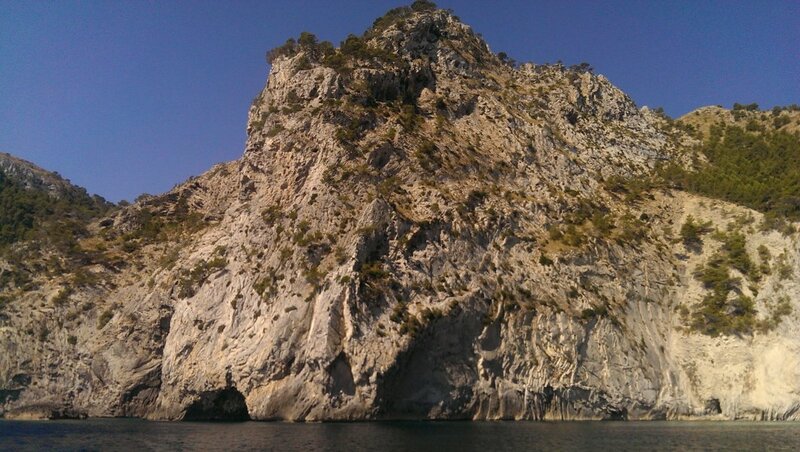 Sea cliffs of Puig des Boc. 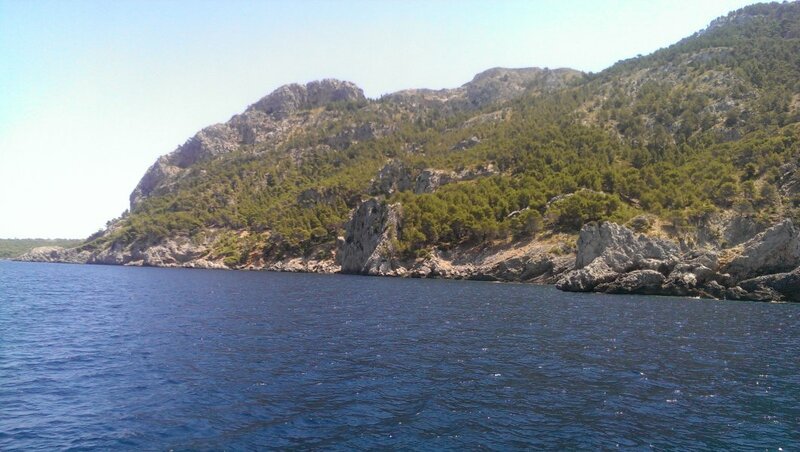 Sea cliffs between Puig des Boc and Sa Talaia Vella. 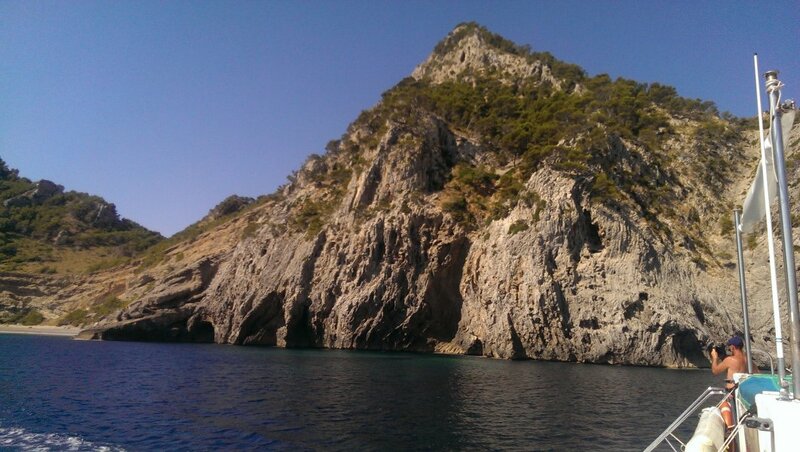 Sea cliffs on Puig des Romani. 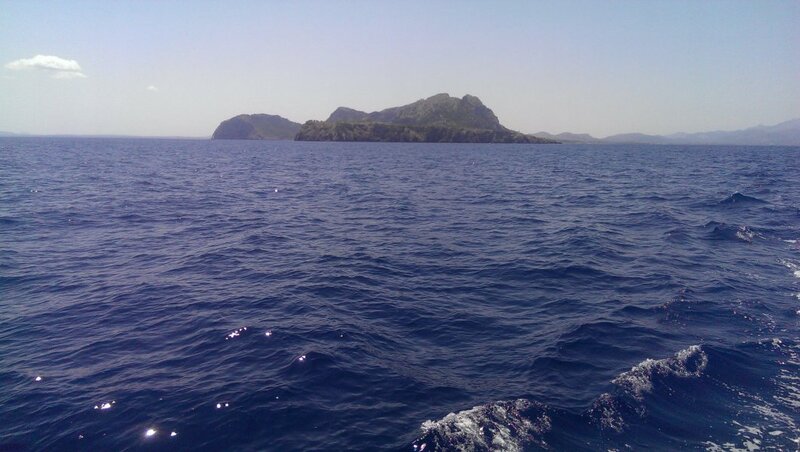 Rounding Cap des Pinar, the tip of the Alcúdia Peninsula. Sa Teula, Puig des Boc and Puig des Romani, with the slopes of Puig de Massanella in the distance. 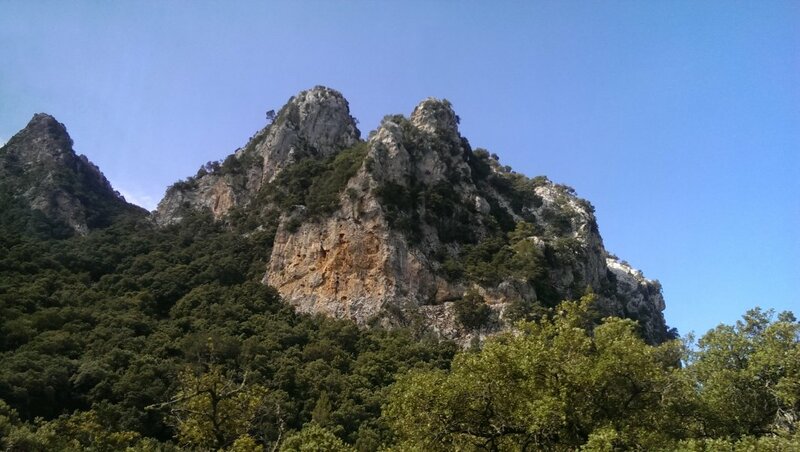 Penya des Migdia crags on Puig des Romani. 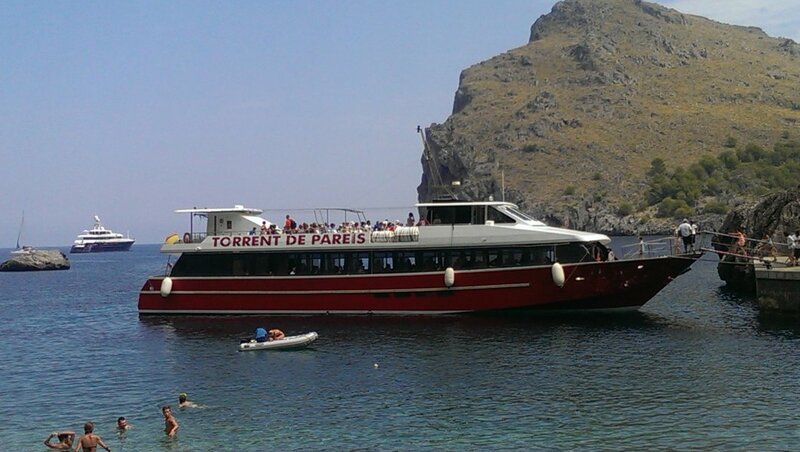 Swimming and snorkelling at Es Dolç, below Mirador de la Victòria, before heading back. 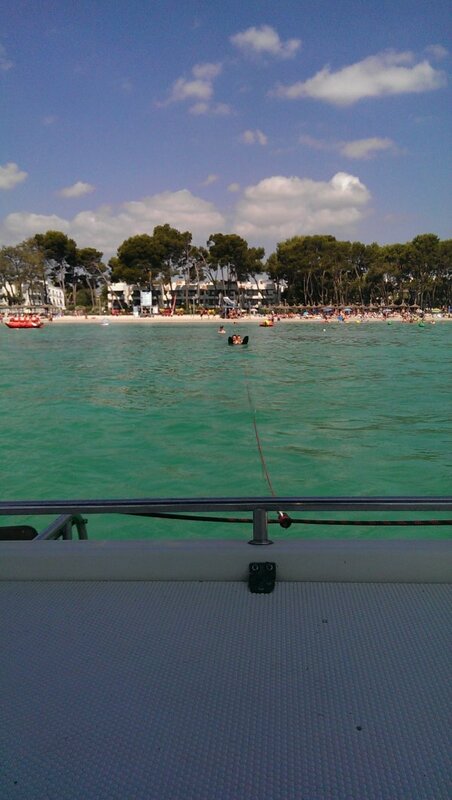 Water skiing between the piers at Port d'Alcúdia. 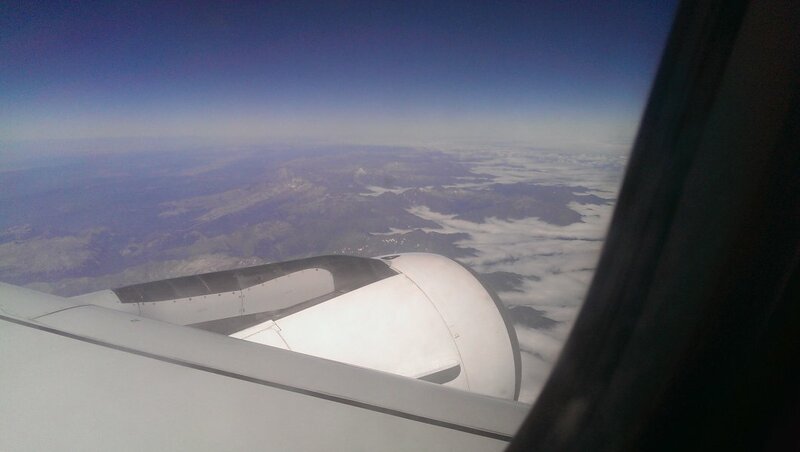 Returning over the western Pyrenees, with their northern side blanketed by an inversion cloud. The little patch on the left tops out at Contiella (2912 metres), while the ridge above the engine tops out at Pico de Posets (3375 metres - second highest in the Pyrenees). The distant ridge, which forms the border between Spain (left) and France (right), tops out at Monte Perdido (3355 metres - third highest in the Pyrenees). Aneto (3404 metres), the highest mountain in the Pyrenees, is obscured behind the engine.